The Peanut Gallery – 2017 Review. 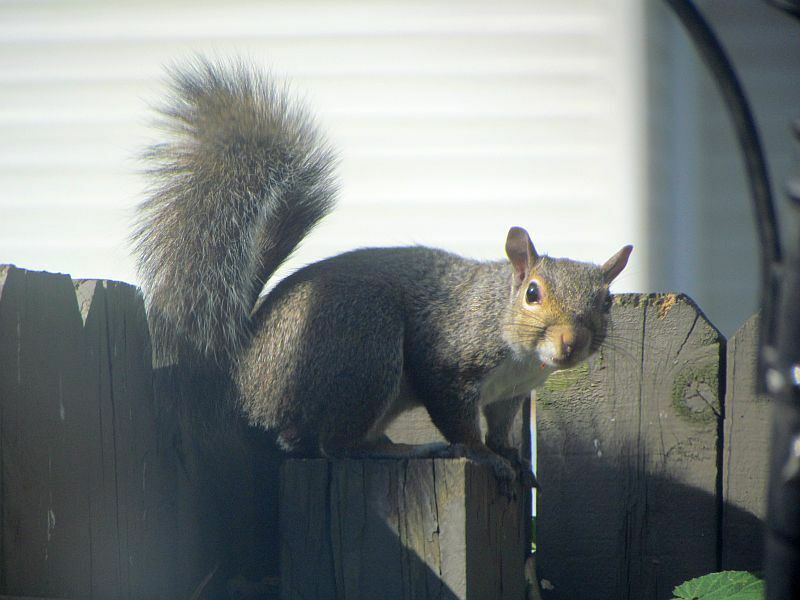 It’s the new year, and that means it’s time for a review of last year’s visitors to my patio! This is the 7th annual review, the 2nd at my new residence. Previous yearly reports can be found here: 2011, 2012, 2013, 2014, 2015, 2016. Two wildflowers ran rampant over my patio last year. 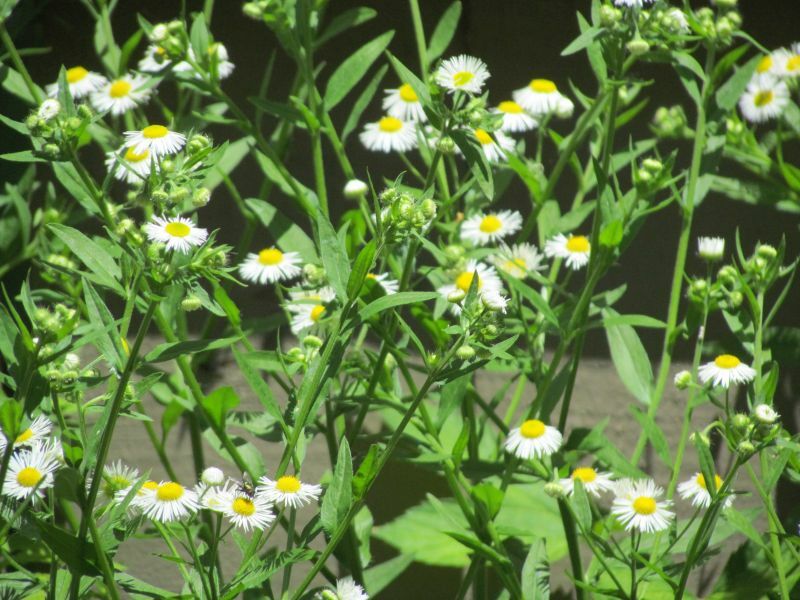 Late spring and summer saw my patio covered with Fleabane. It’s a pretty wildflower, and I did a blog post on it years ago. They grew dense and tall. 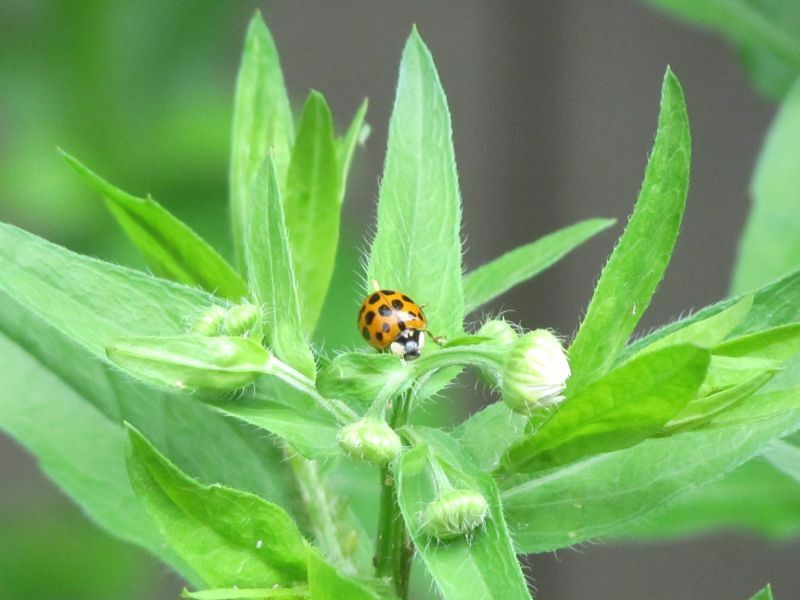 Late summer and autumn saw Lady’s Thumb proliferate, replacing the Fleabane. This plant too grew dense and tall. 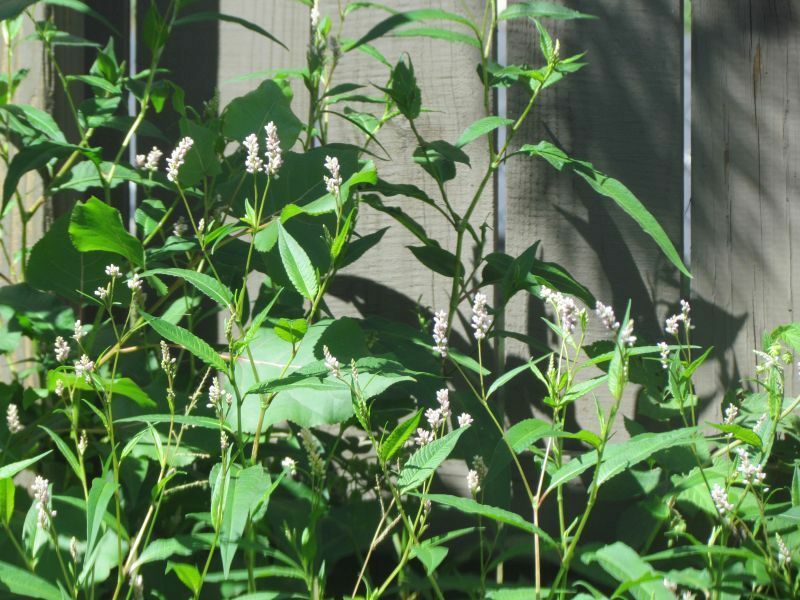 Lady’s Thumb is also called Smartweed- I grew up calling it Knotweed. These plants hung on until early December, being rather hardy. Other wildflowers (some call them weeds!) that showed up in far smaller amounts included Helianthus, Sowthistle, Canada Thistle, Wild Lettuce, and Alfalfa. Seeds may have been blown here or carried by birds- or they may even have been in birdseed I put out. Oh, and a tree started growing on my patio- a Cottonwood. That’s the Cottonwood sapling in the corner, among all of the Lady’s Thumb. 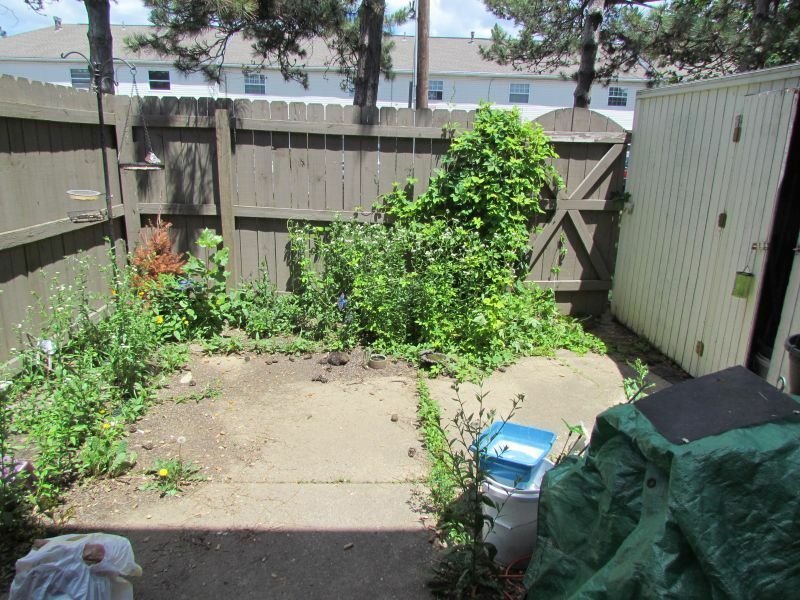 As you can see, the garden area is allowed to grow whatever grows there. Nature is taking over! Now, onto the birds! 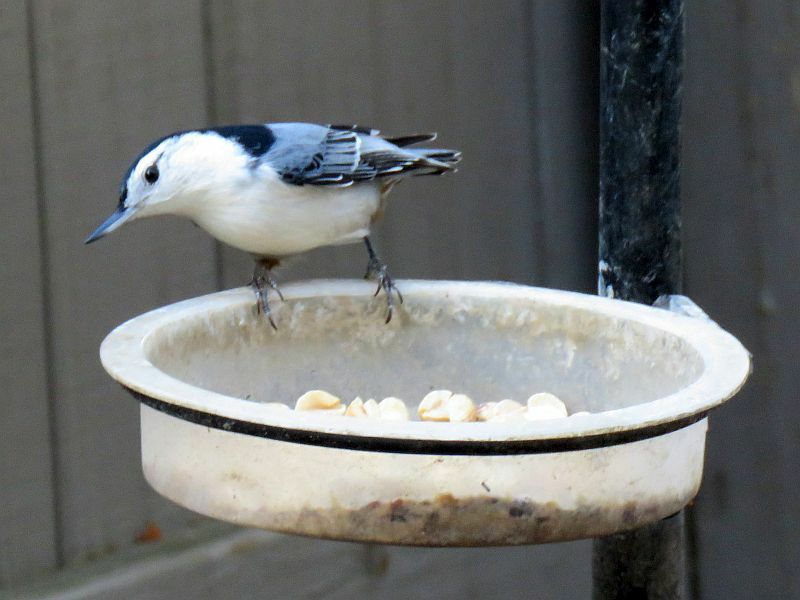 I didn’t have Red-Breasted Nuthatches like I did in 2016, but a few other new species showed up. Let’s get started! The local Cooper’s Hawk occasionally visited the patio looking for a snack, though the last half of the year I didn’t see it much. 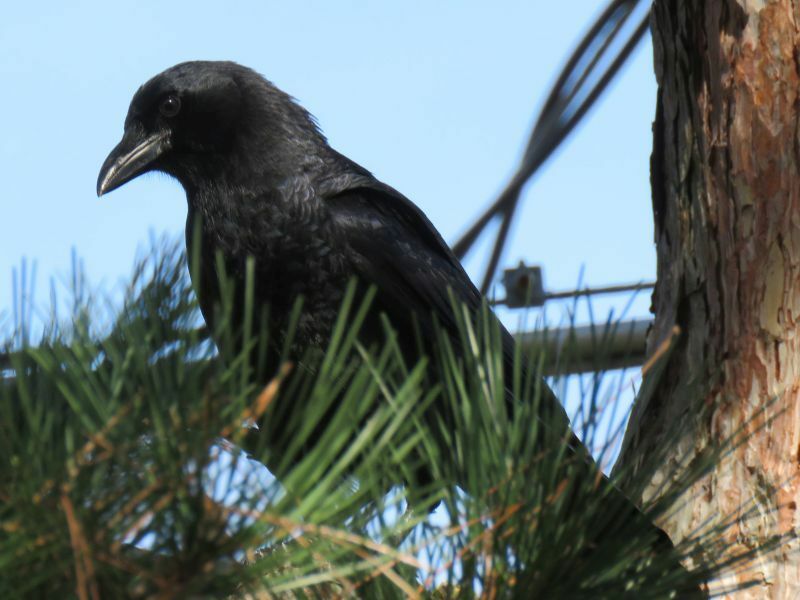 Crows were the next-biggest birds to visit. Year after year, they come back, bringing their young ones along. The family size varies, with the previous years’ young birds often staying to help raise the newest youngsters. Between four and eight birds made up the family group last year. 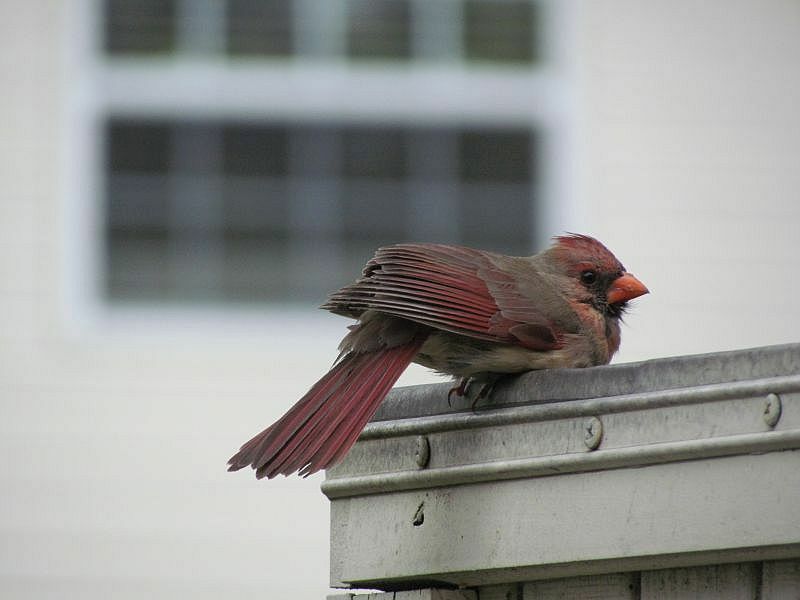 As I’ve noted before, they are very intelligent birds, recognizing me and my car (they know who likes to throw peanuts to them!). 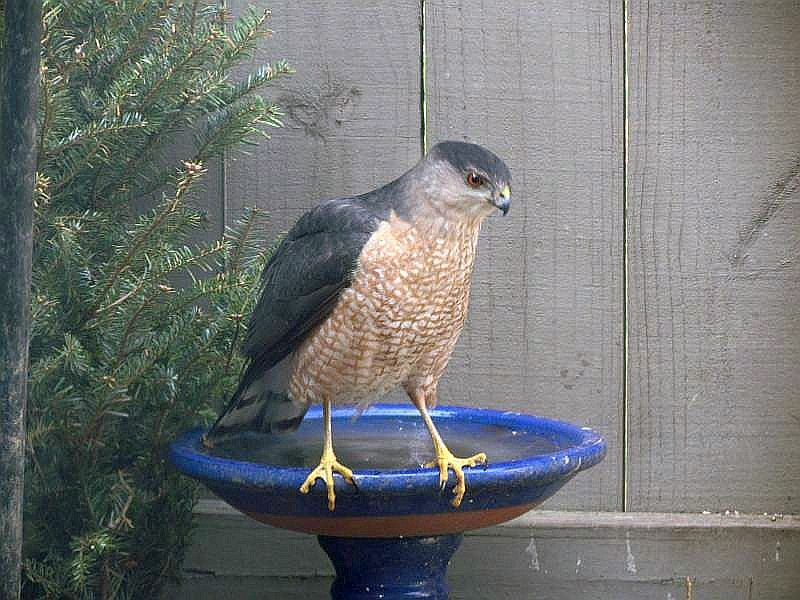 They sometimes chase the Cooper’s Hawk (and vice versa) and are ready to raise a ruckus if a cat is around. The evergreens growing next to my patio is a hangout for them. 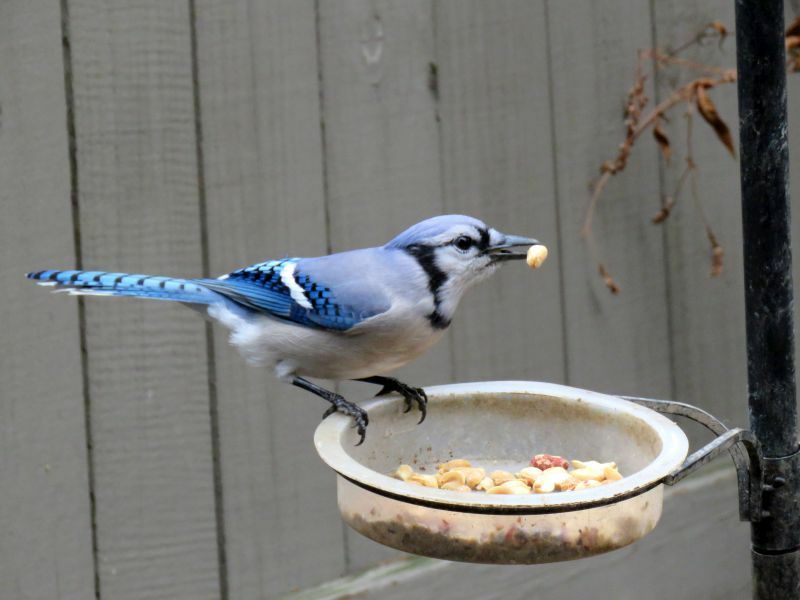 They don’t come down to the patio, but I throw peanuts to them over the fence. Why limit yourself to one peanut? Madness! 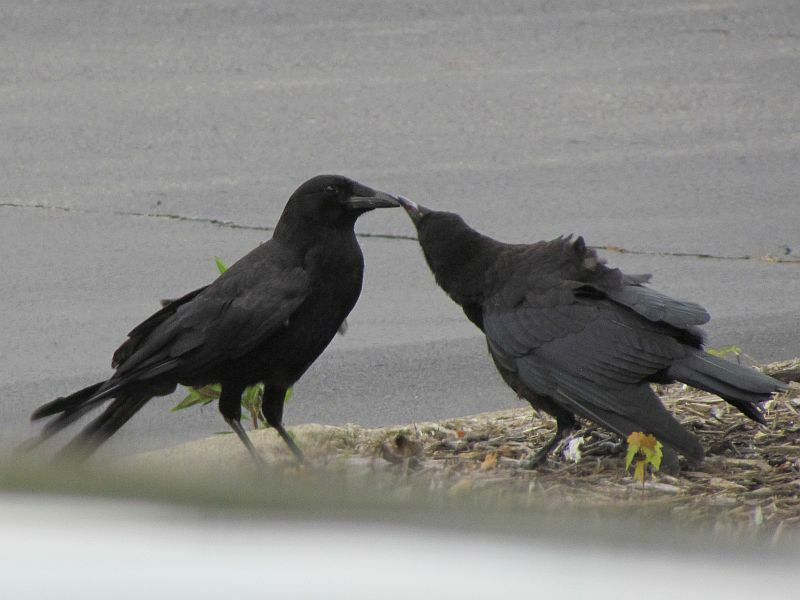 Here’s one of 2017’s juvenile Crows getting fed by a family member out in the parking lot. Looks like the young guy is always hungry! There were at least two juveniles that showed up with the family in July. Sooner or later, you have to figure out what is edible and what is not on your own. 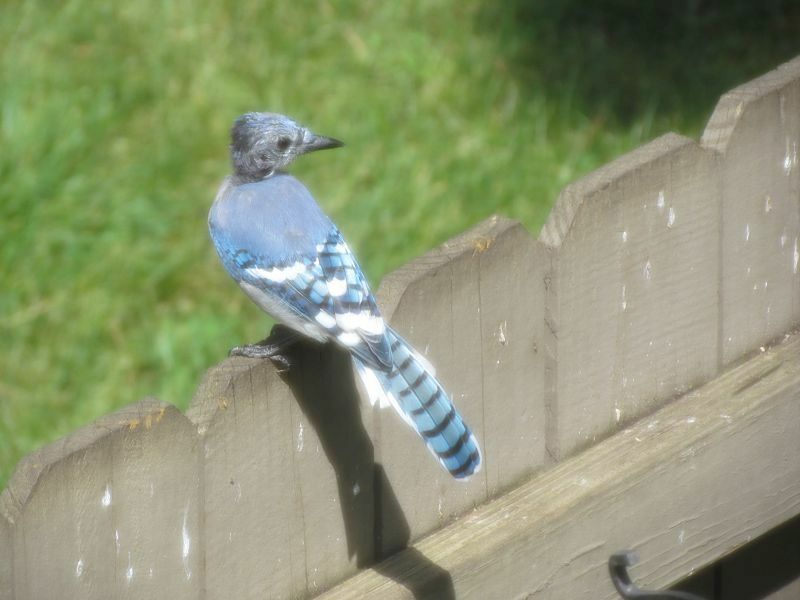 Sticking with larger birds, here’s the classic ‘blue bomber’- Blue Jays became fairly regular visitors. 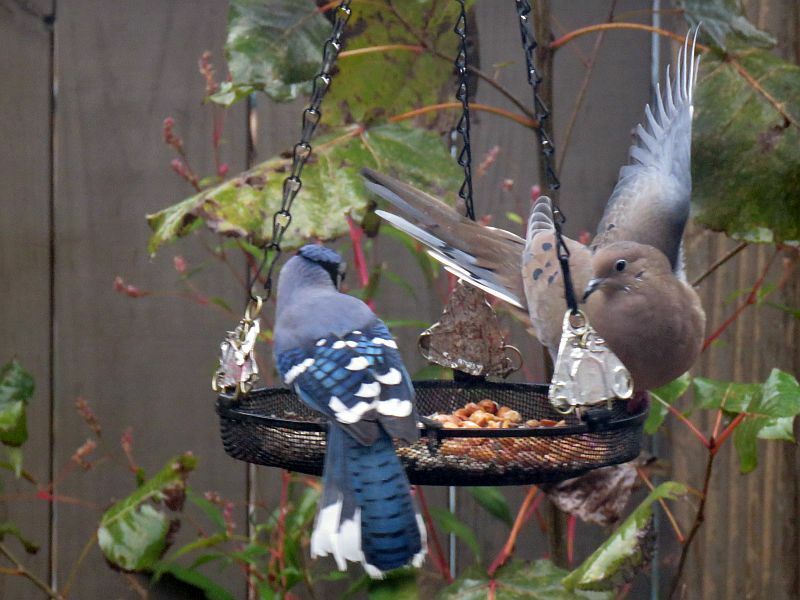 A group of four of them fly in from the north to raid the feeders. From their looks I’m guessing they are young birds from the same nest. 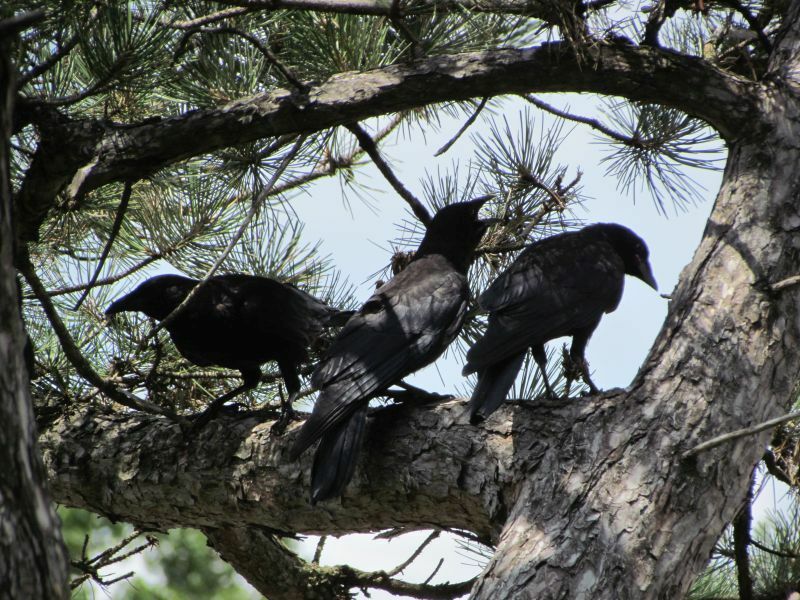 These birds make some funny noises, including mimicking hawk calls. I’m guessing this is done to scare other birds away from the feeder! 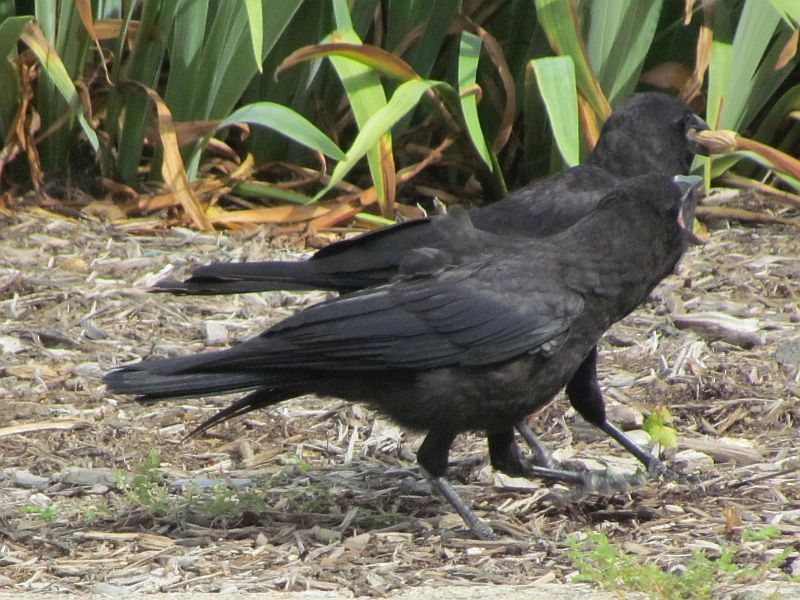 These birds- related to Crows- often stuff their gullets with multiple peanuts and carry them away to eat or hoard. 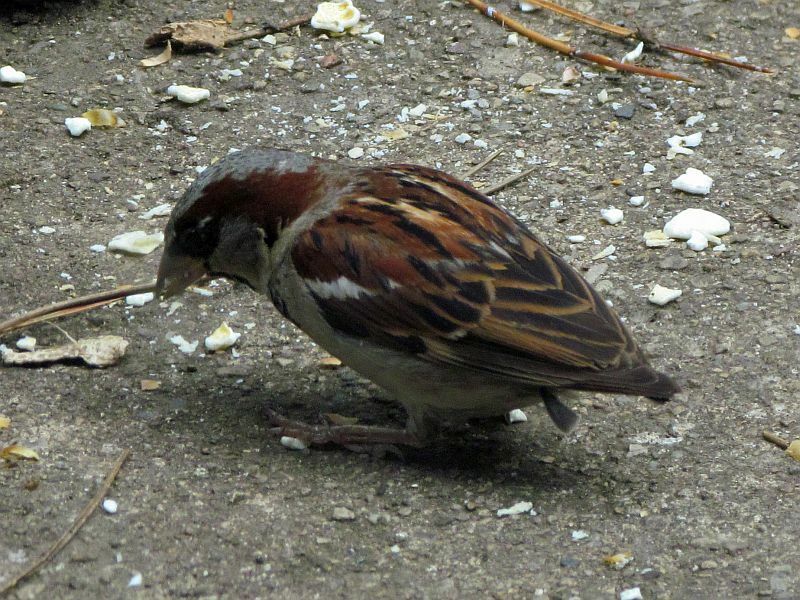 This bird here is semi-bald- it’s molting in the late summer. I did a post on molting a while back. 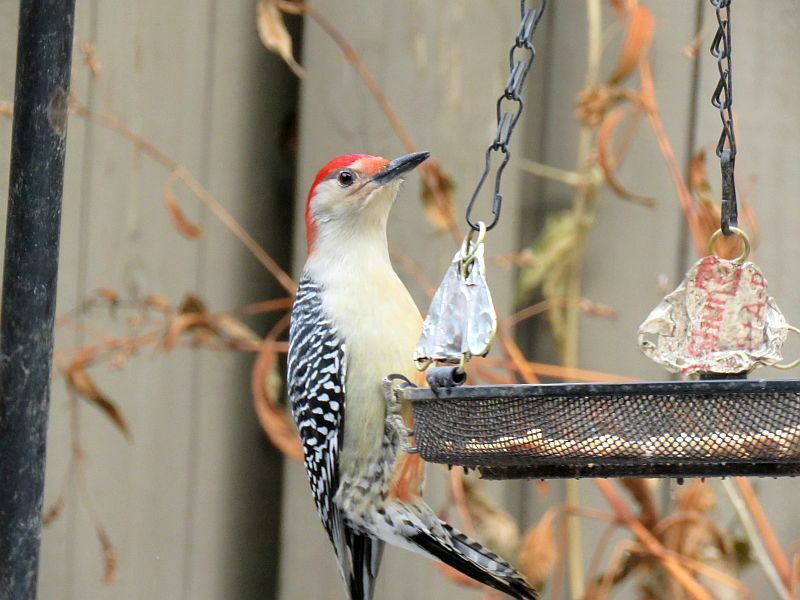 There’s a Red-Bellied Woodpecker that visits the feeder for peanuts- a big but cautious bird, it often lands on the fence to look around, or keeps an eye on the patio from nearby trees before flying in. I see this bird more in the cold weather. 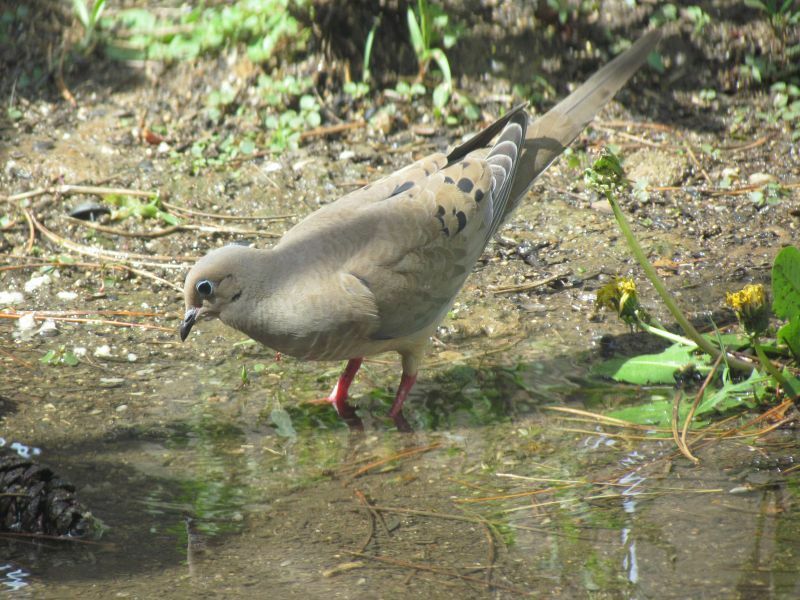 Mourning Doves seem to come in smaller numbers than last year. 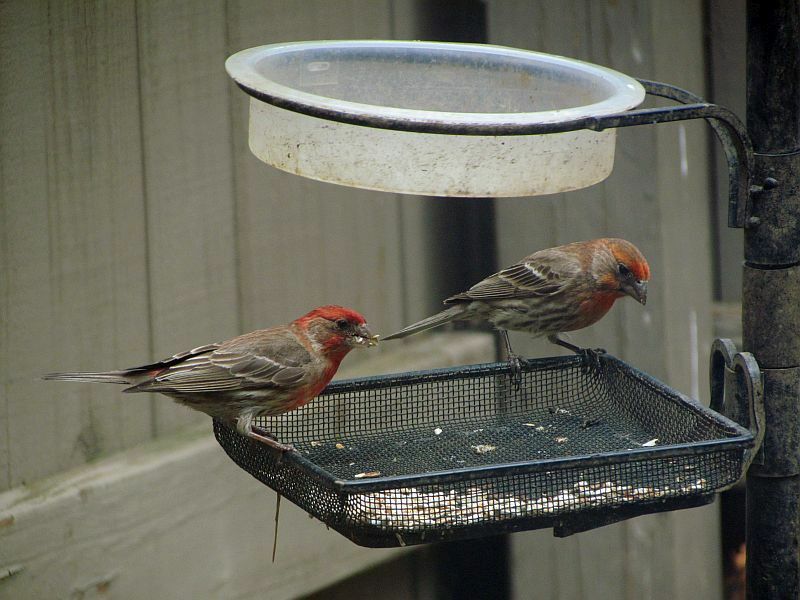 They’re typically ground feeders, but the ones that visit my patio have taken to eating out of the biggest feeder tray suspended from my feeder pole. 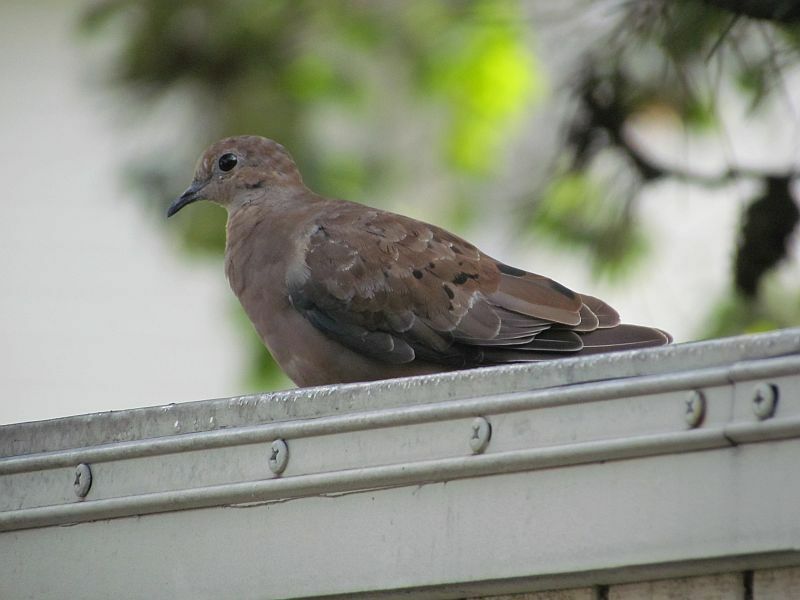 The above Mourning Dove is reacting to the Blue Jay that just landed near it by spreading its wings so it looks bigger and more menacing- an instinctive reaction I’ve seen in pet doves. 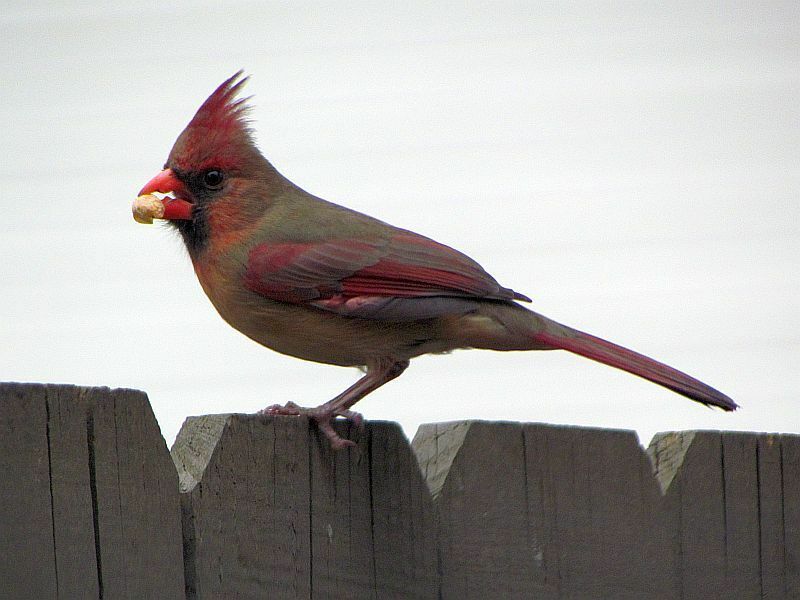 I have a one or two pairs of Cardinals that visit the feeder, often at dawn and at twilight. It’s always enjoyable seeing them. 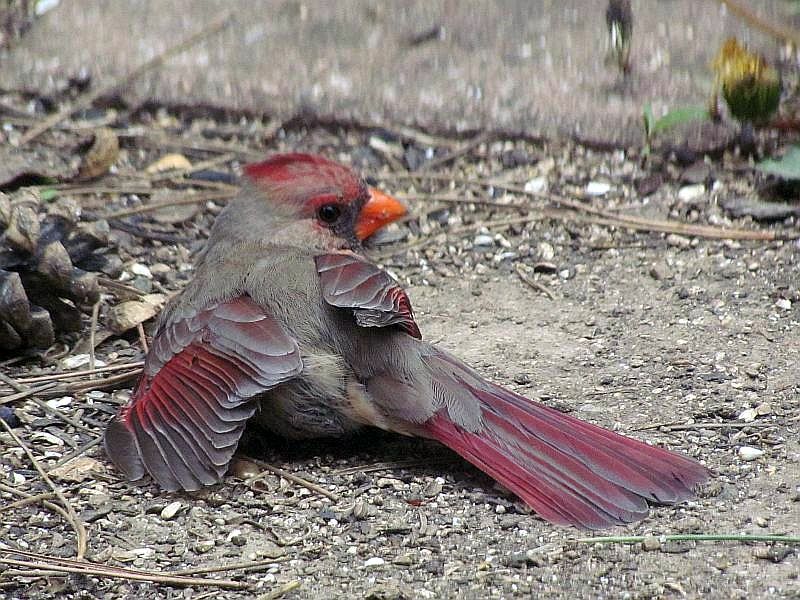 This is a poor female Cardinal with some kind of injury or disability. Her legs and tail seem to be partially paralyzed. She could fly weakly but not very fast or accurately. 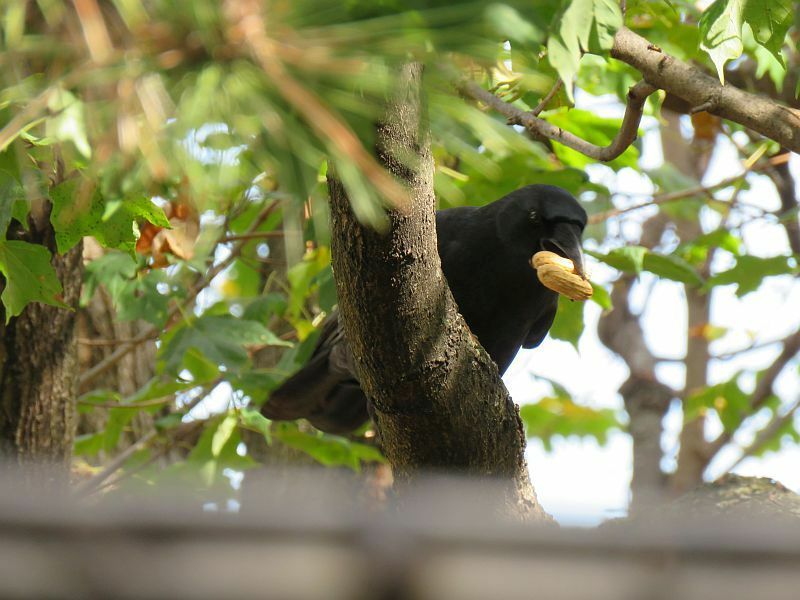 She showed up last May, eating food I had put on the ground. I tried to catch her to take her to the Ohio Wildlife Center, but she wouldn’t let me near her. Here’s her mate feeding her. 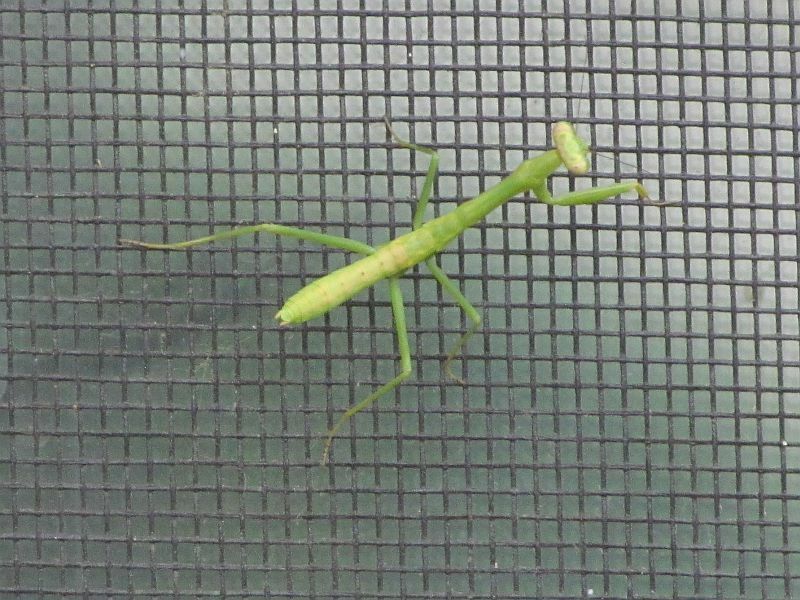 After a few days of her coming to the patio, I never saw her again. 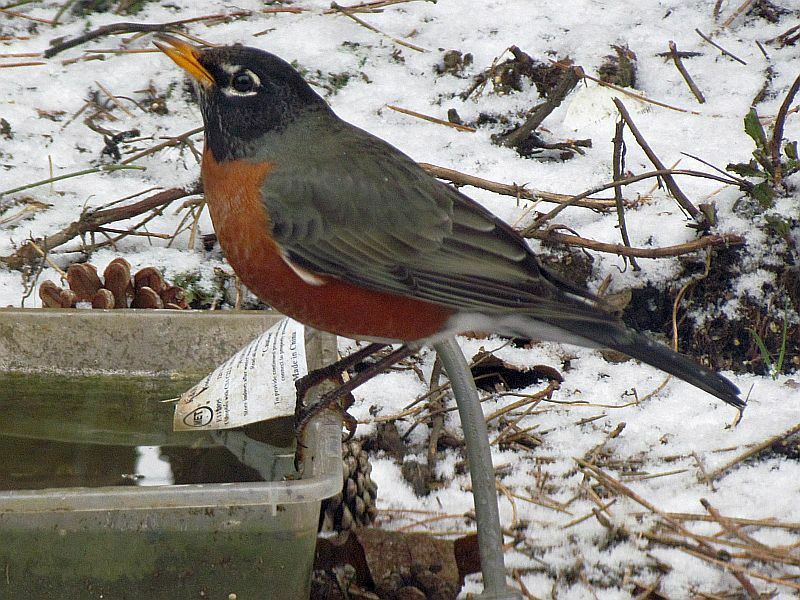 I have the occasional Robin visitor in winter. 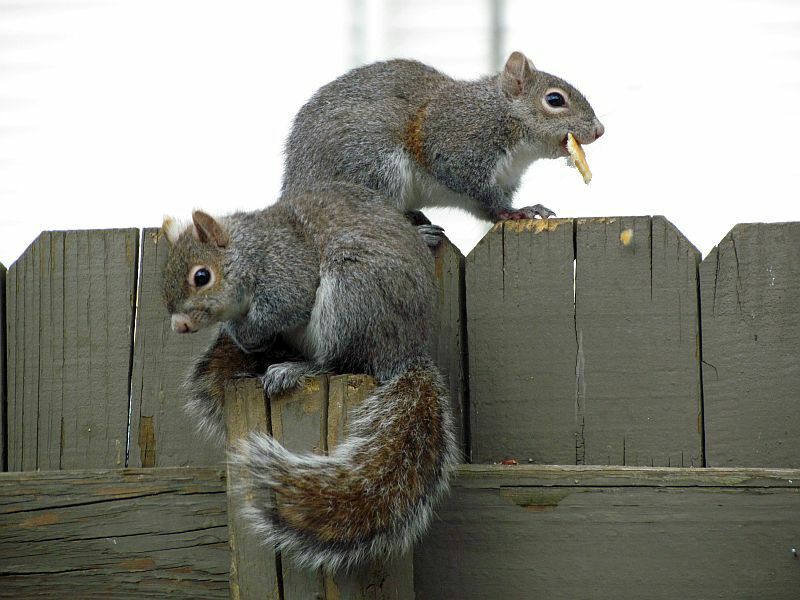 I put raisins and berries out for them, some winters are rough on them and they need the food if they show up on the patio. 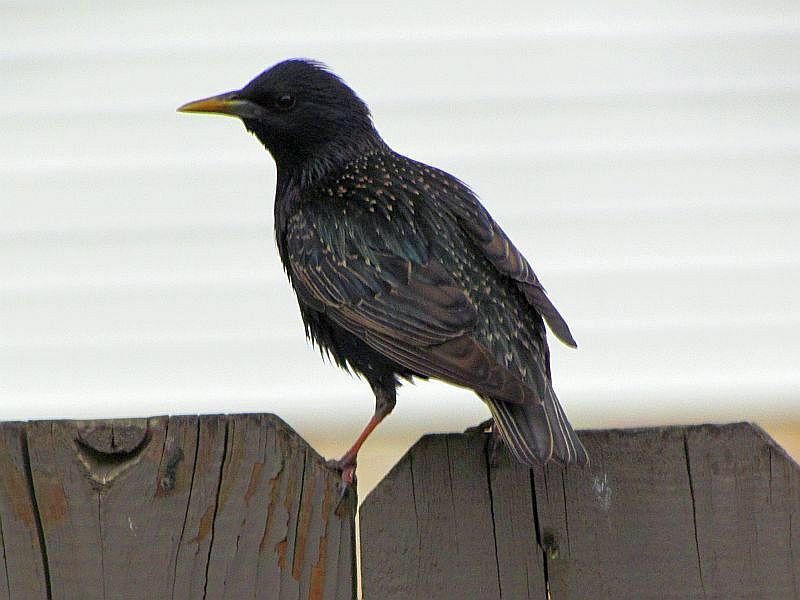 Starlings are occasional visitors as well, often in winter. They’ll eat anything! 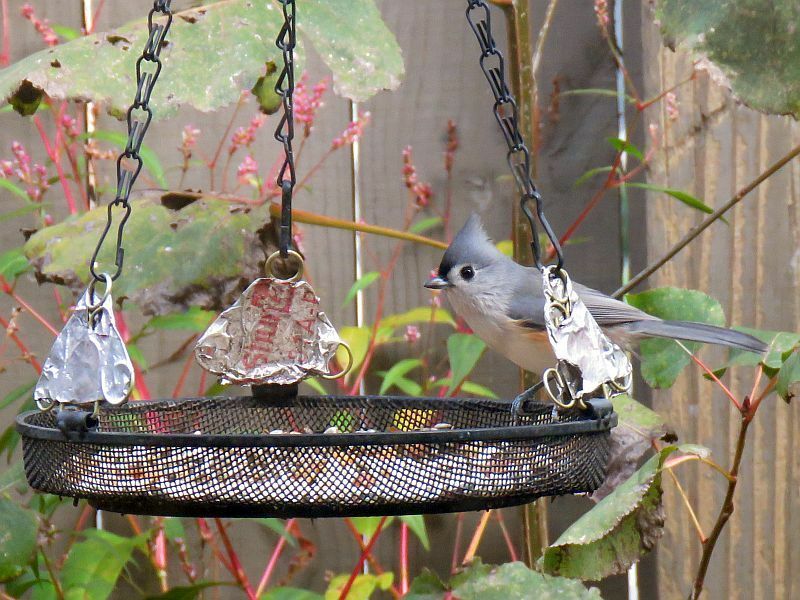 Another new bird on my patio- a Tufted Titmouse. 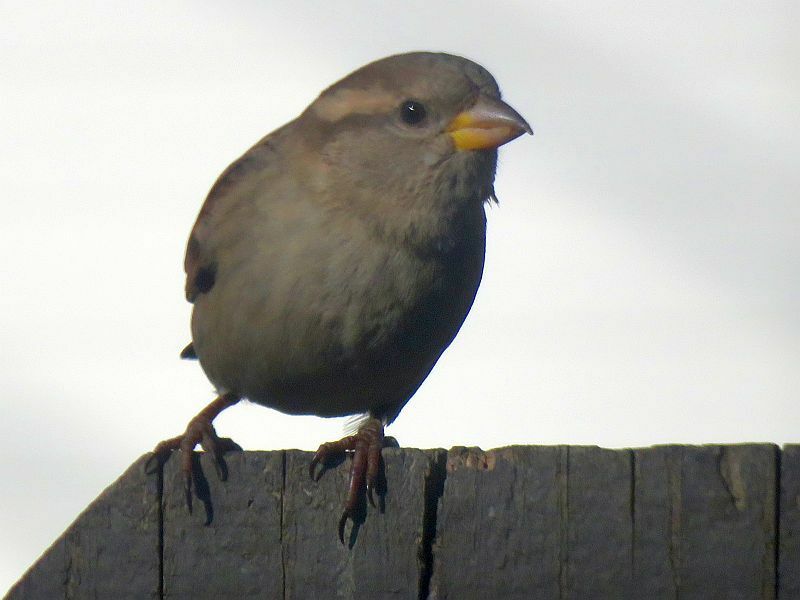 Common enough out in the ‘wild’ one or two of them visit my feeders rarely. 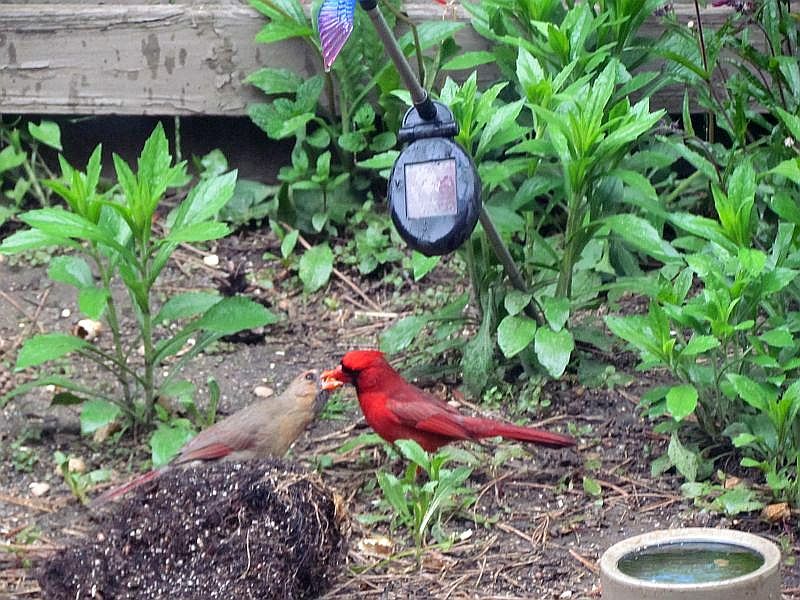 They look like small Cardinals with that crest. 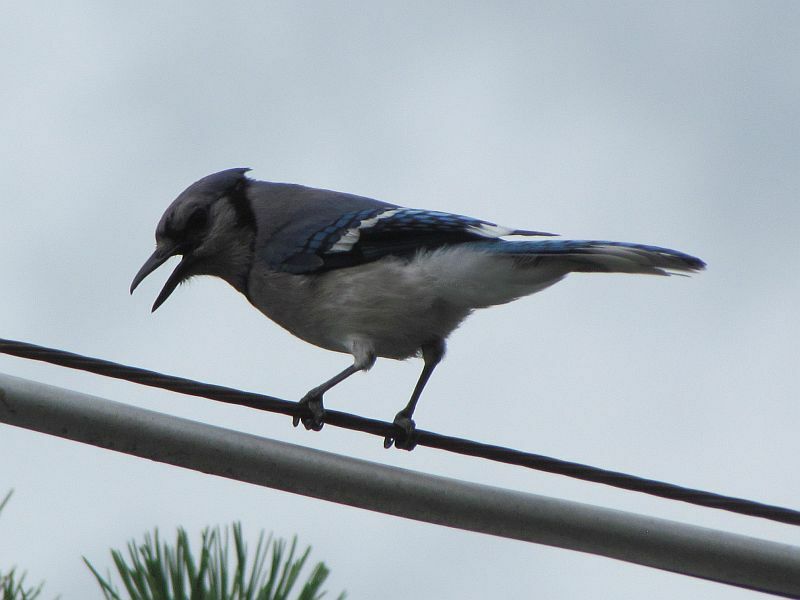 These birds make a lot of different calls, keeping you guessing what you’re hearing at times. 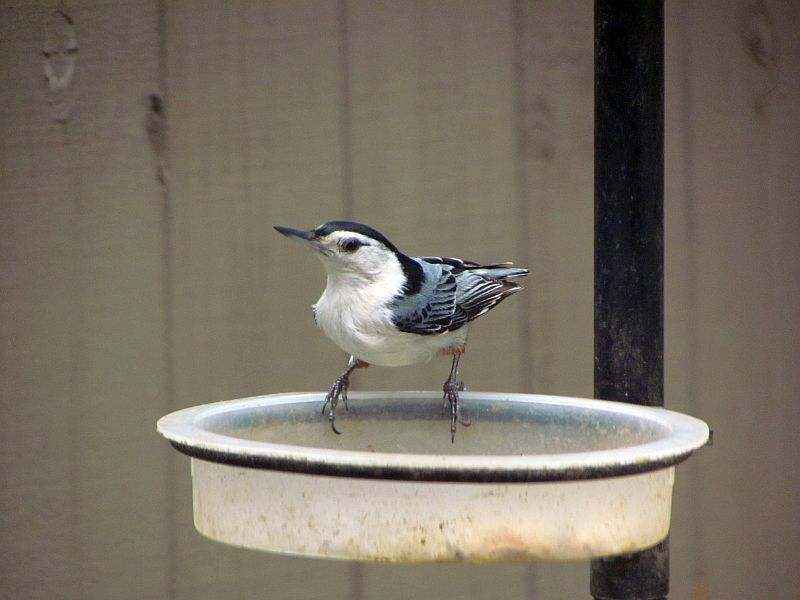 An old favorite bird of mine- a White-Breasted Nuthatch. Two of them visit my feeder for peanuts. They carry away peanuts and come back quickly enough that I suspect they are stashing them in little nooks in the bark of trees. 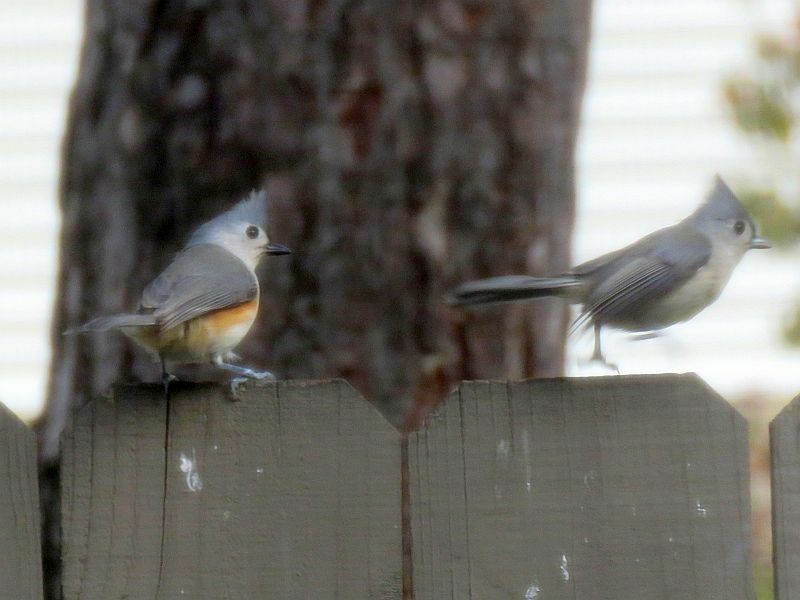 I’ve had them land only a few feet away from me on the fence while I’m putting out more food. You always know when they are around by their nasal ‘yank yank’ calls. 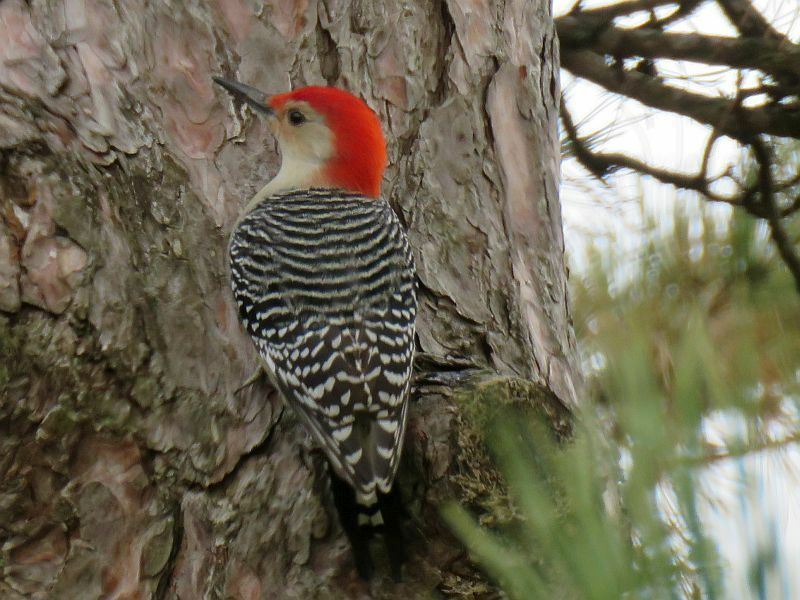 Pleasant birds, they- like Woodpeckers- walk up and down the trunks and branches of trees, looking for edibles. 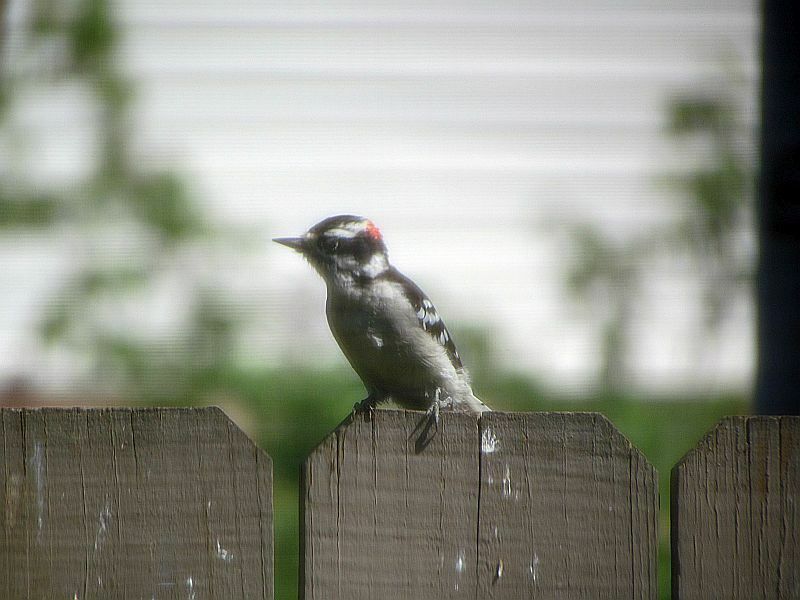 Speaking of Woodpeckers, here’s another that visits for peanuts, a Downy Woodpecker. A pair of them come by occasionally. 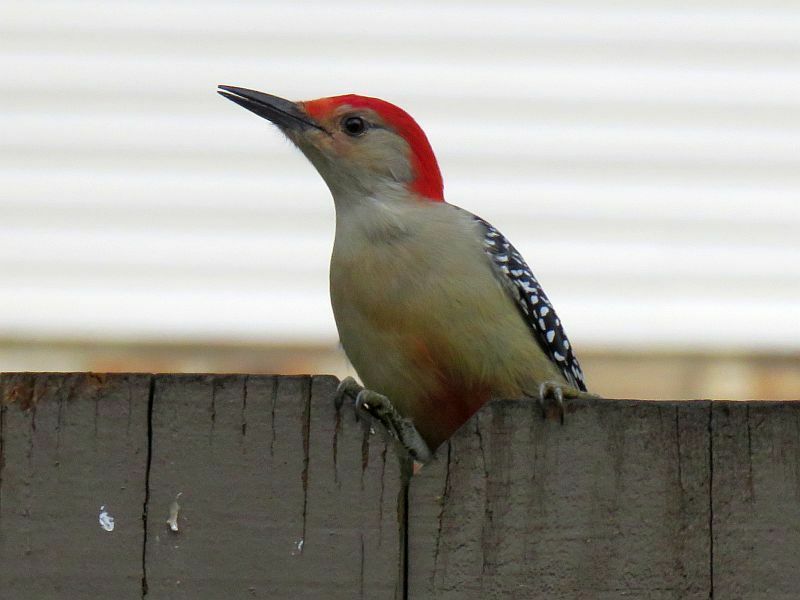 Ohio’s smallest Woodpecker, they are rather shy when they come to my feeders. 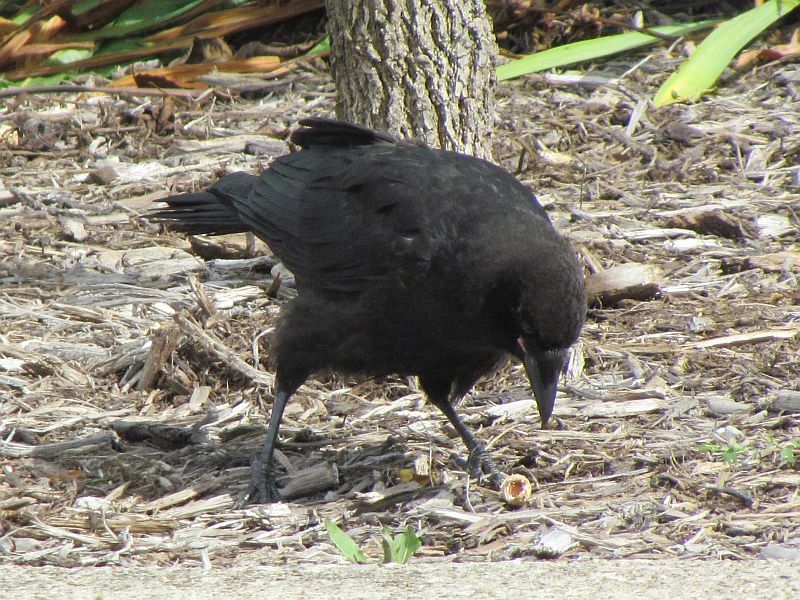 The male has a red patch on the back of his head. 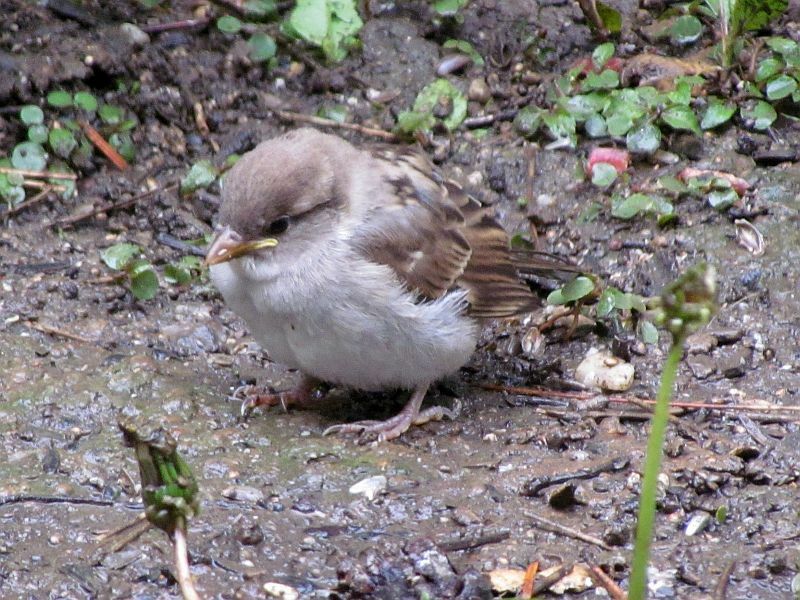 Now, the smaller birds. 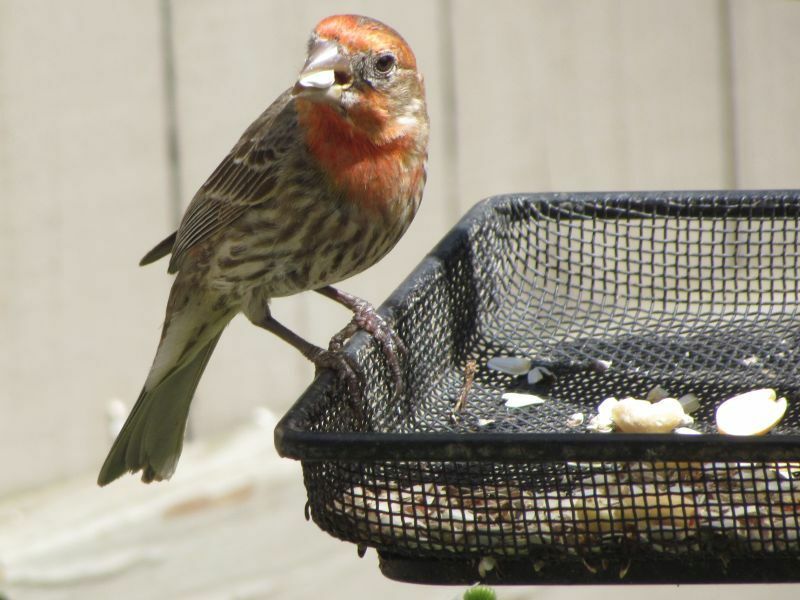 I have three House Finches visit very occasionally for some safflower seeds. 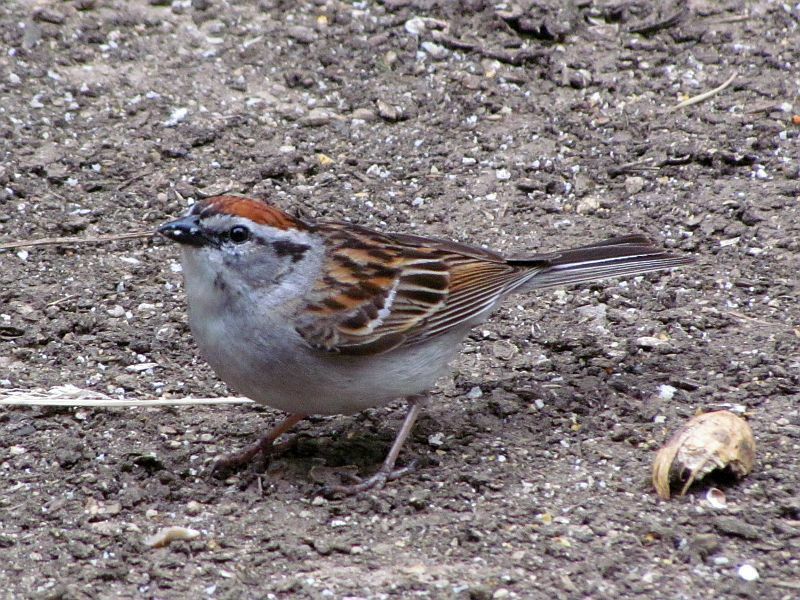 The males wear reddish feather highlights. 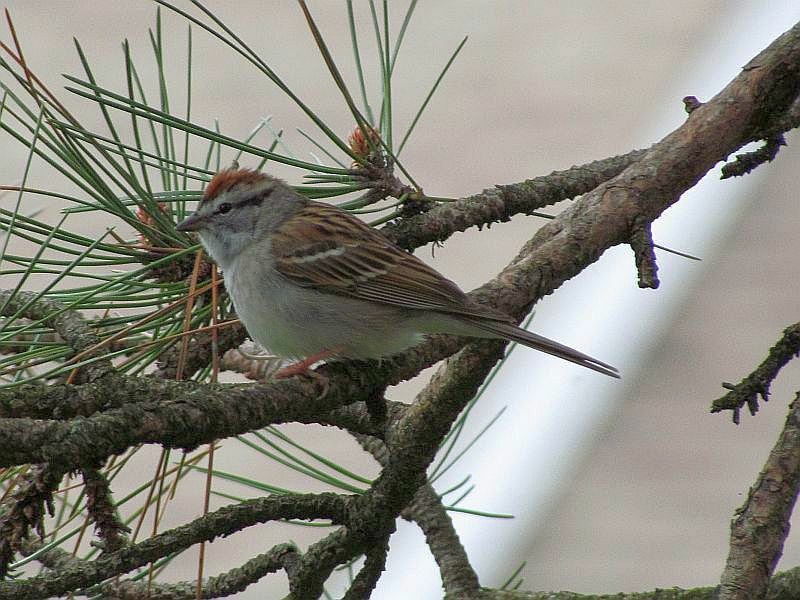 There are plenty of them that nest on the apartment complex. I’m surprised I don’t see them more often. 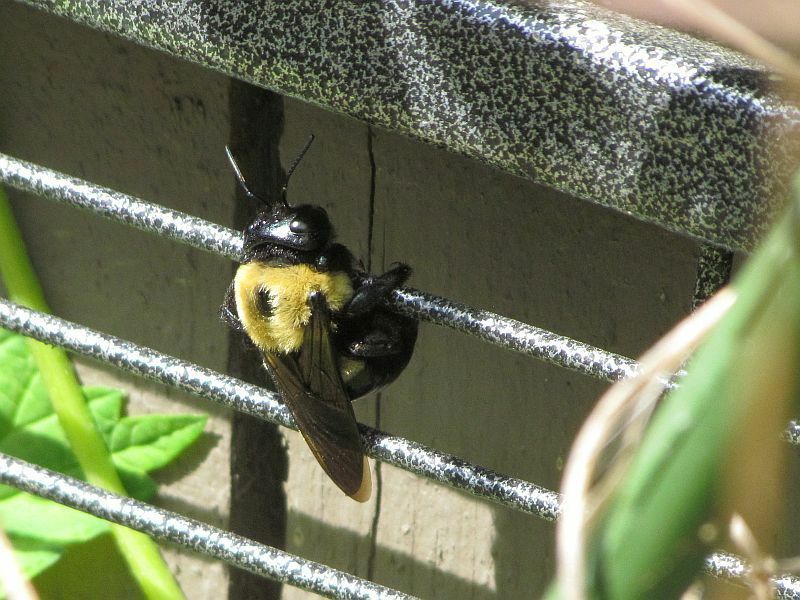 I posted a few years ago about them nesting nearby. 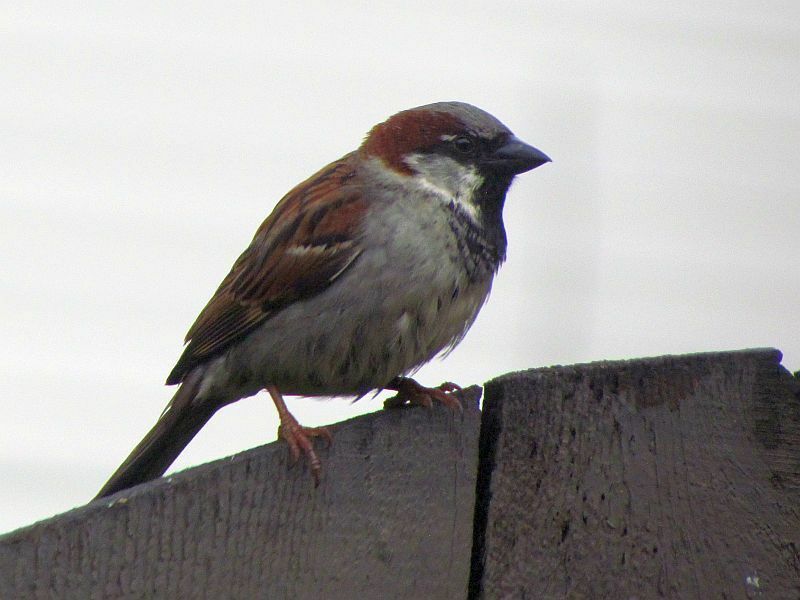 There’s a flock of House Sparrows living in the court where my apartment is. 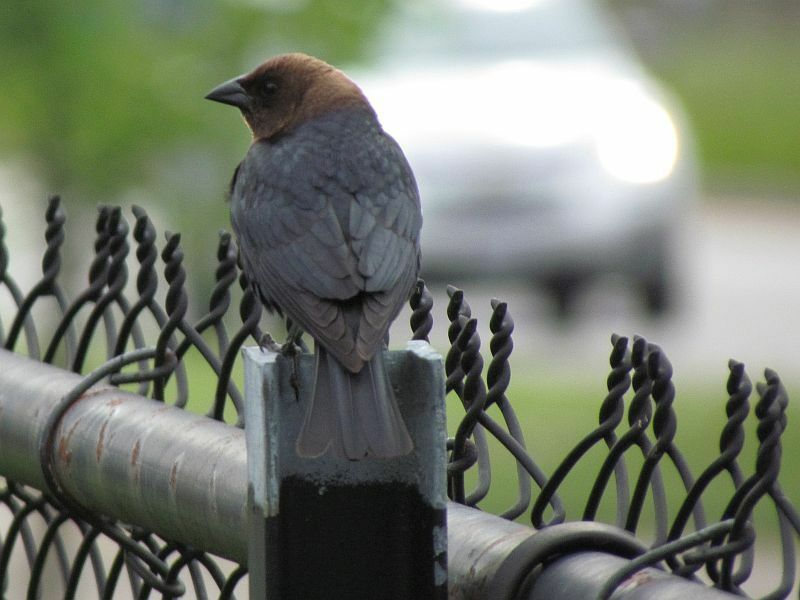 The number I see ranges from one to two dozen birds. 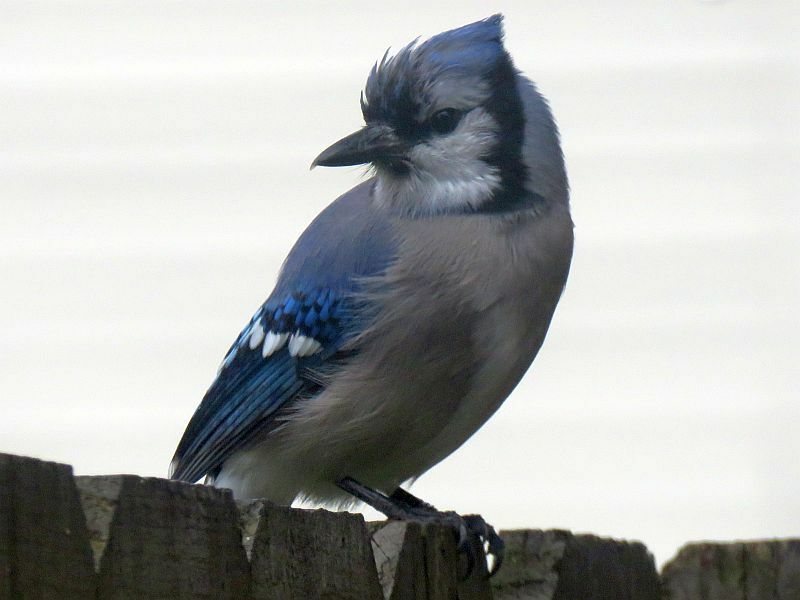 Many birders don’t like them because they are an invasive species, but they’re here and so I appreciate them for what they are. Males and females look quite different as you can see from the above pictures. This male lost his tail, possibly to a cat. 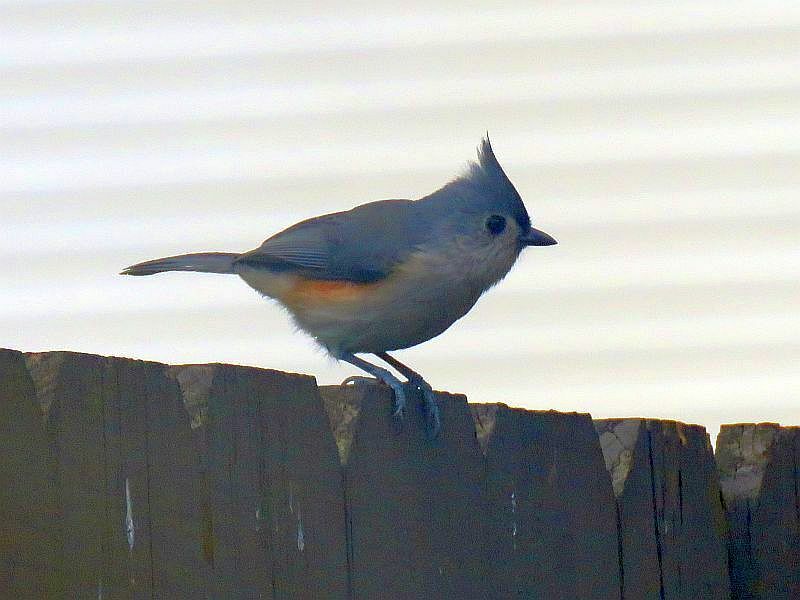 The tail feathers grow out again, no problem! 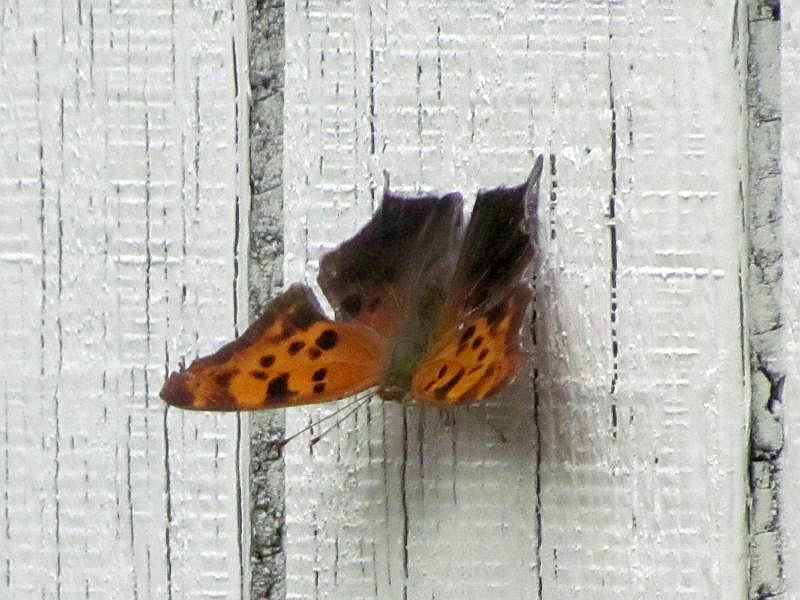 This female is panting in last summer’s heat wave. Birds cannot sweat, so they pant to help cool themselves off. Mama feeds her young one. 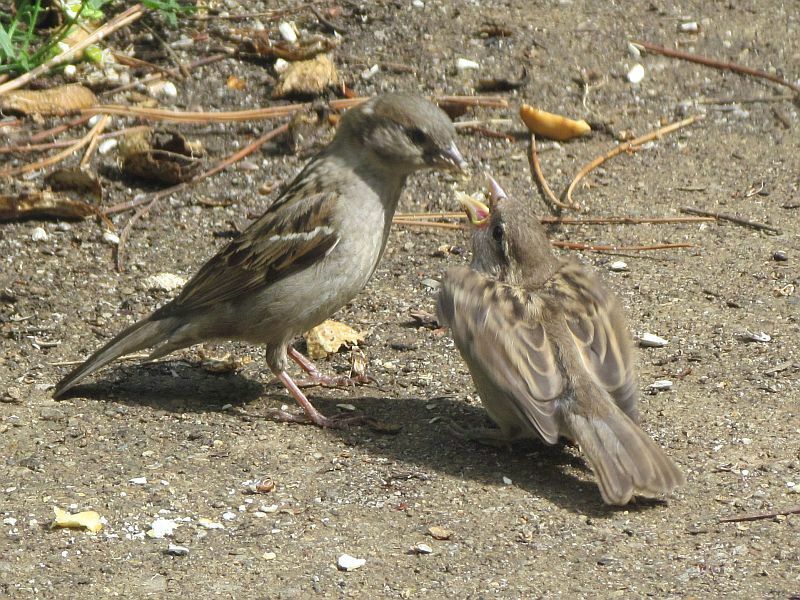 A young bird hangs out with dad. 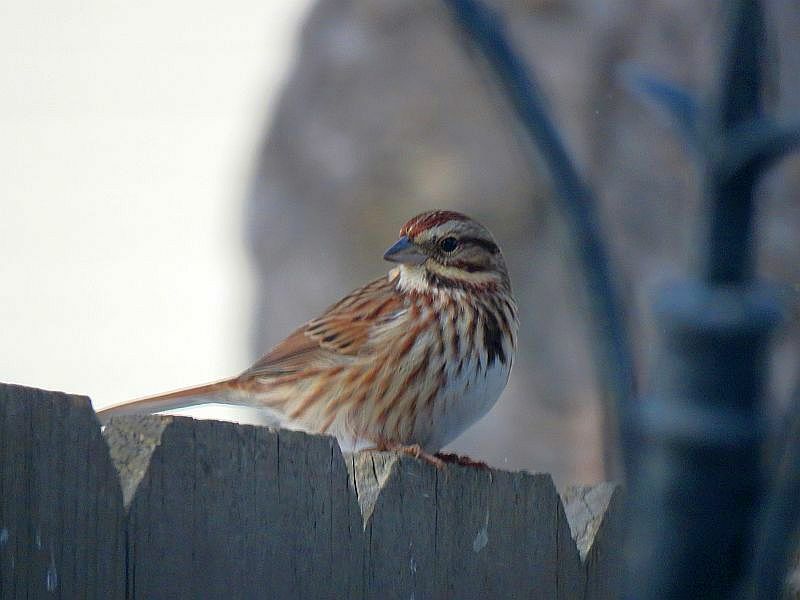 Chipping Sparrows also can be fairly tame. 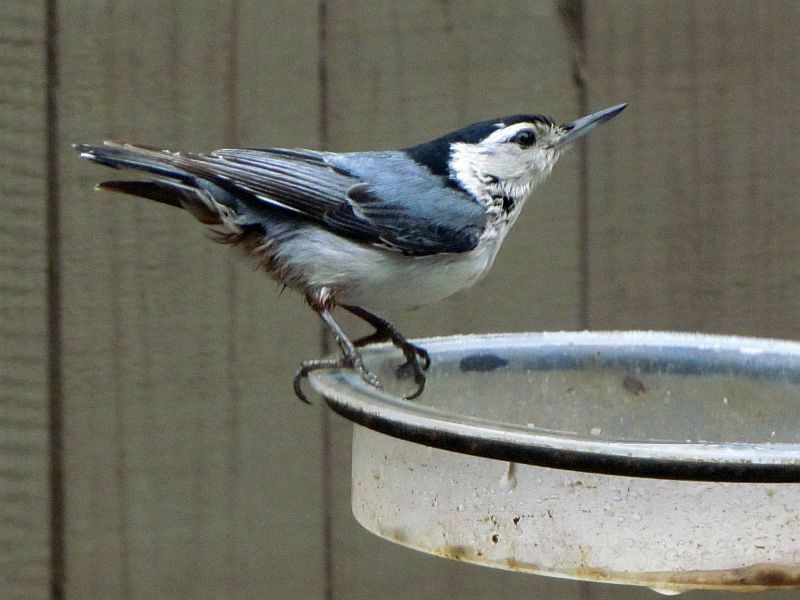 One pretty much flew down in front of me when I went out to fill the feeders- I’d toss it some food. 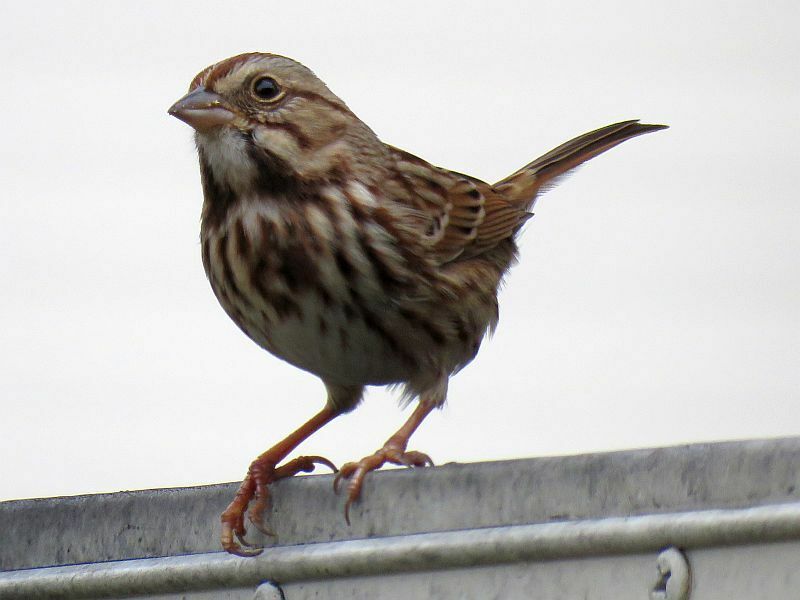 Two Song Sparrows- I think they are a pair- hang out around my apartment. Their soft calls are quite recognizable, as is their song. 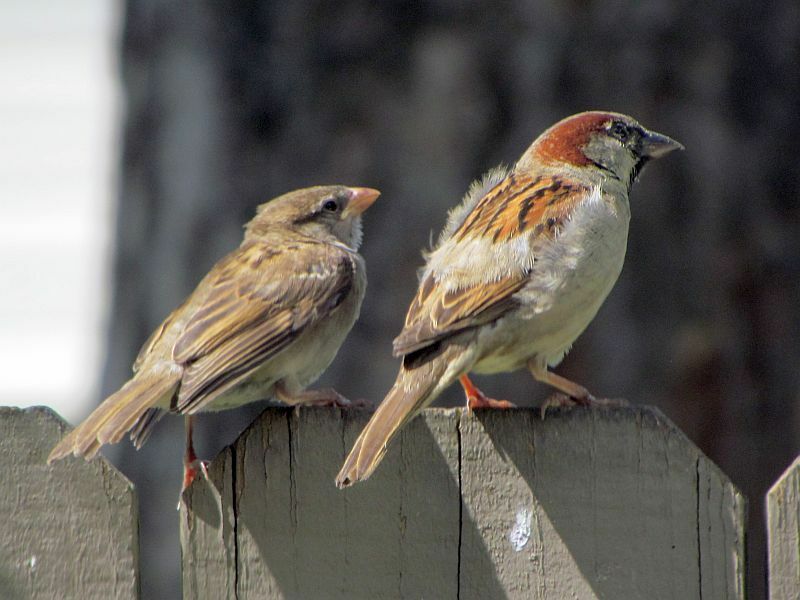 These are birds that don’t like crowds (House Sparrows often crowd them out). 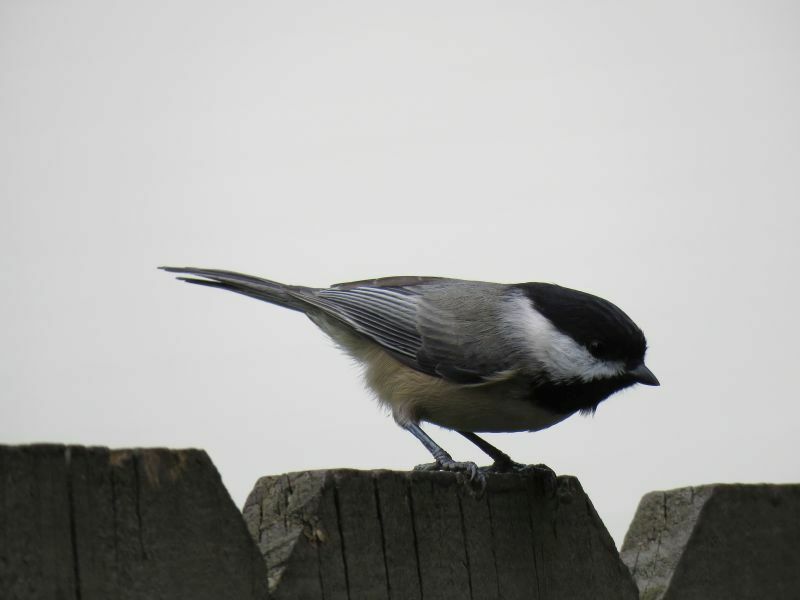 Recently, in the cold snap going on currently, one has taken to landing on the fence just feet away from me as I put out bird food- they know when they see me it’s like ringing the dinner bell. 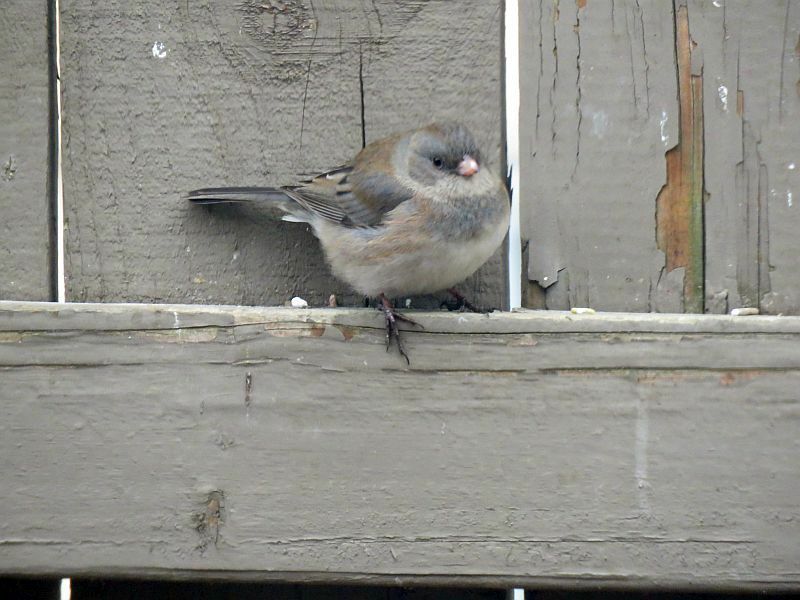 The last of the sparrow species I see on the patio are winter birds- Dark-Eyed Juncos. 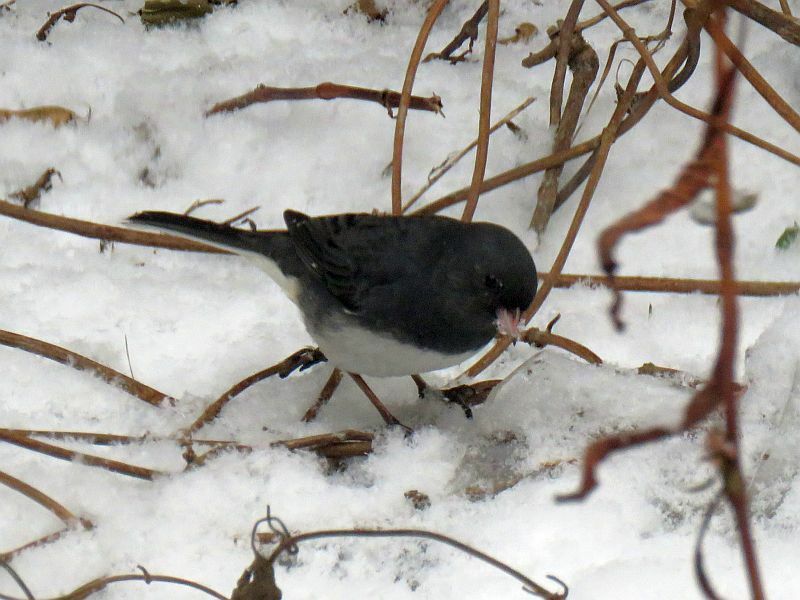 The colder and snowier it is, the more Juncos I see. I did a post about them years ago. 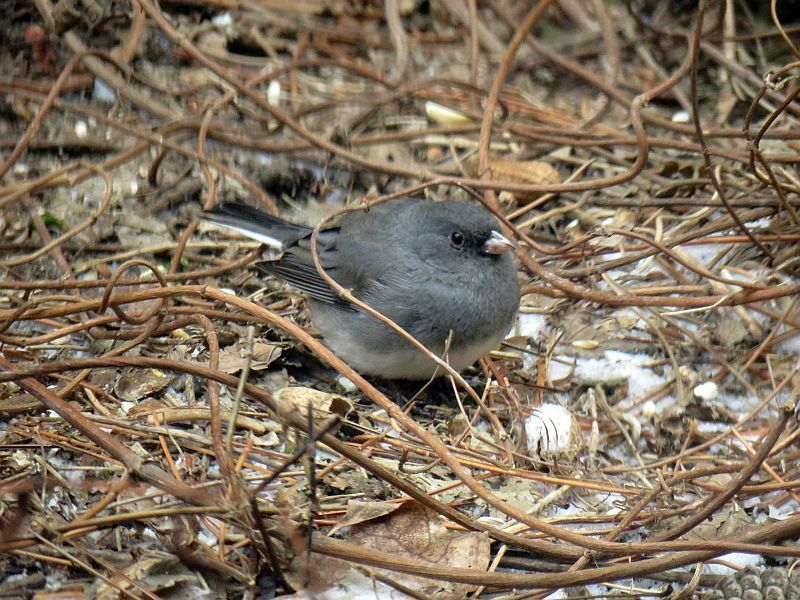 I’m not sure if this is a female, immature, or one of the subspecies of Dark-Eyed Junco. Details can get confusing! 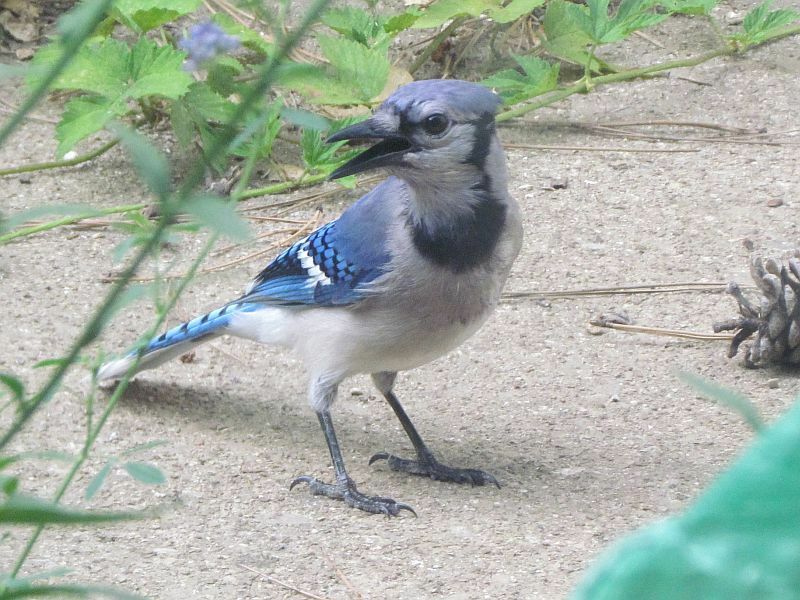 This is the smallest regular avian visitor to my patio. 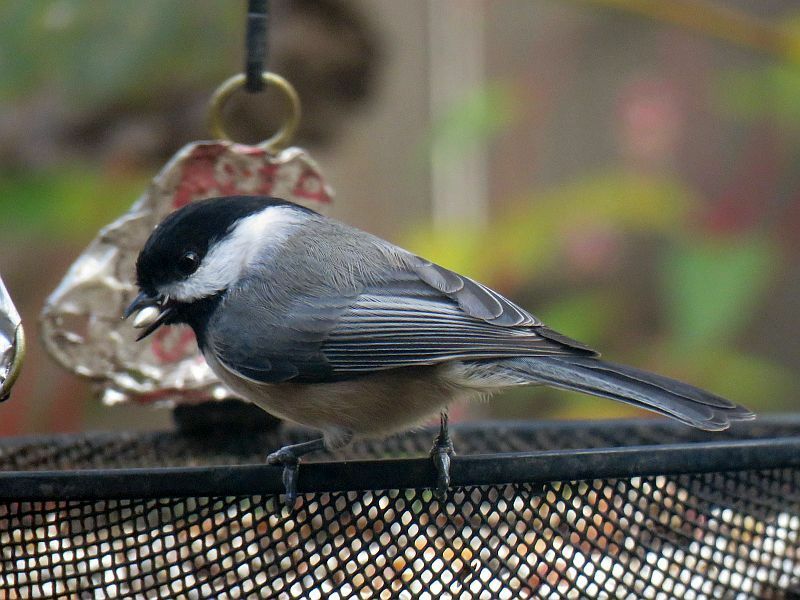 Carolina Chickadees visit year-round and love stashing seeds and peanuts in hidden caches. Usually I see from one to three of them- sometimes more in the last half of summer, when young birds tag along with their parents. 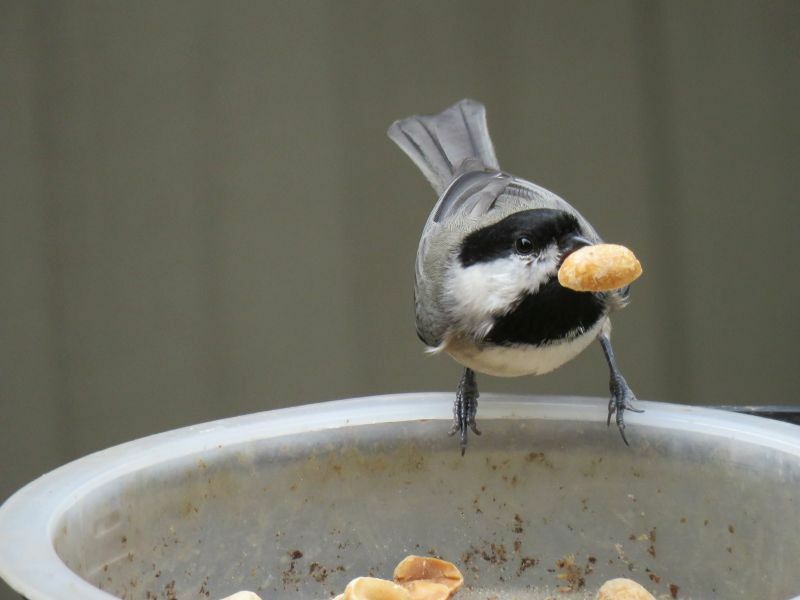 This Chickadee is eating (or stashing) a safflower seed. 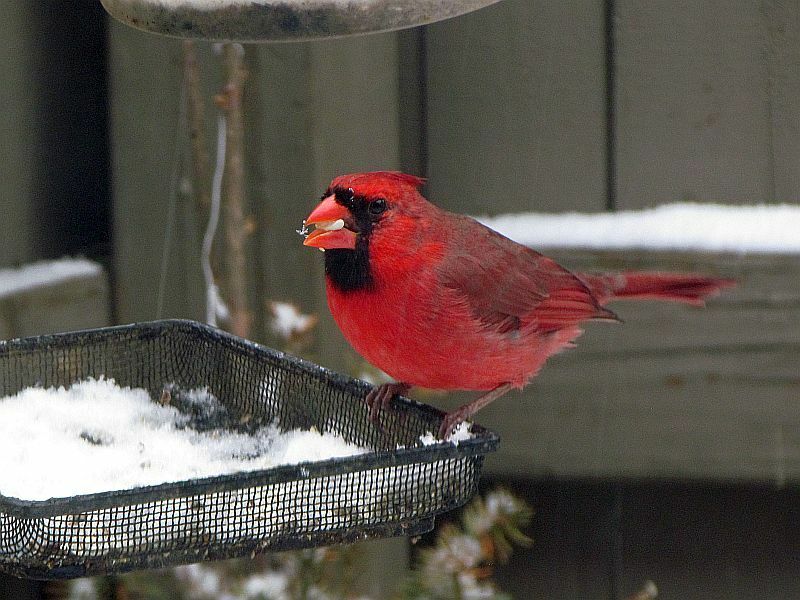 If you want to feed Chickadees, Doves, Cardinals and Finches, this is a great seed to put out. 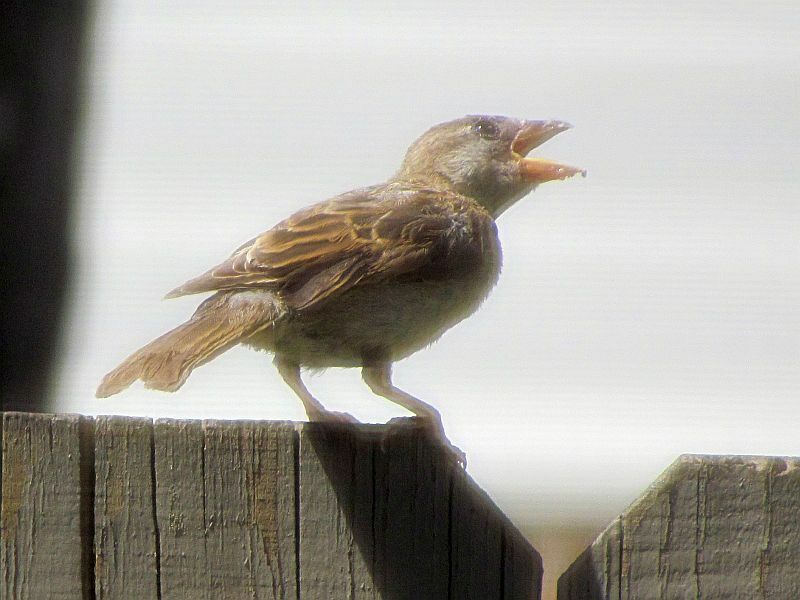 Birds like House Sparrows and Starlings usually don’t eat it. Twice, I saw a Ruby-Throated Hummingbird buzz my patio. 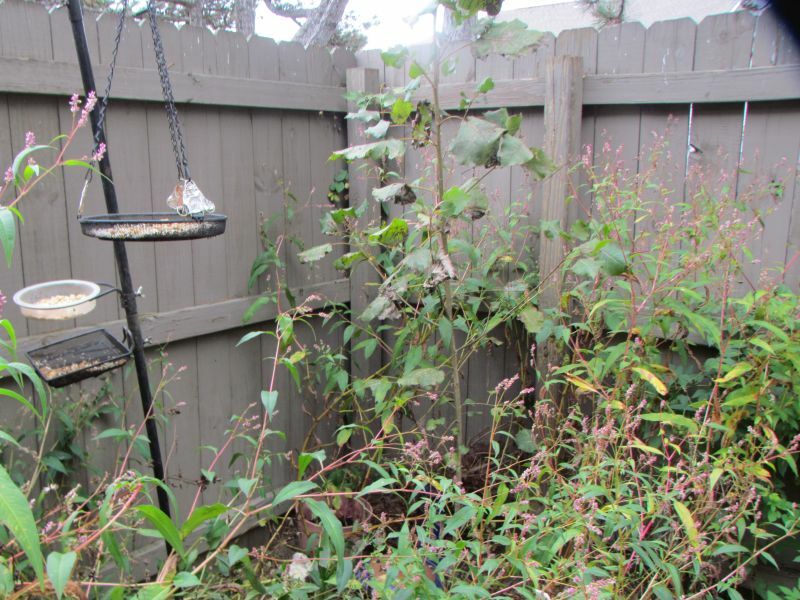 I didn’t get a good photo, but I wondered why I haven’t put up a hummingbird feeder yet! 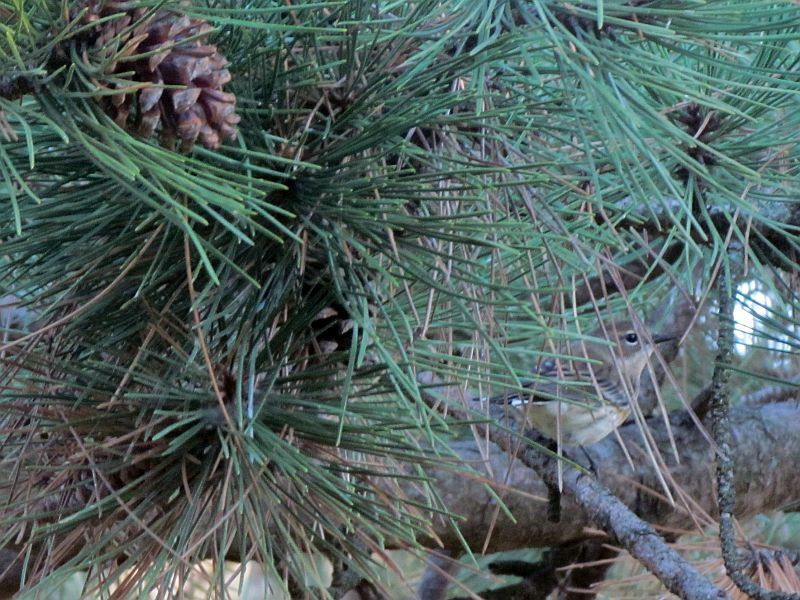 Here’s something I saw above the patio in an evergreen tree- a Yellow-Rumped Warbler. 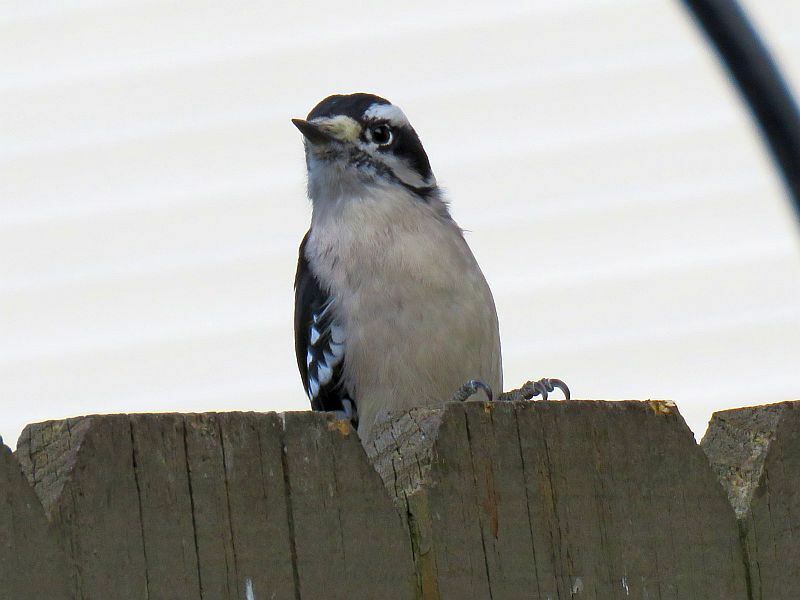 Technically, it wasn’t at the feeders, but I see these birds when they migrate through the neighborhood in the spring and autumn. Furry creatures flourished on my patio last year. A couple of mice zipped around, too fast for photos. Here are the slower furry things I saw. 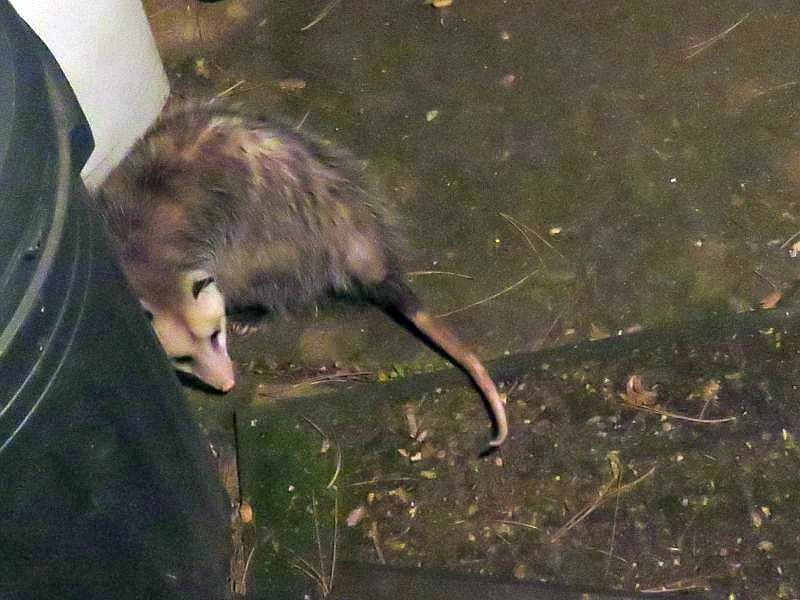 This summer brought three different Opossums to visit at night. 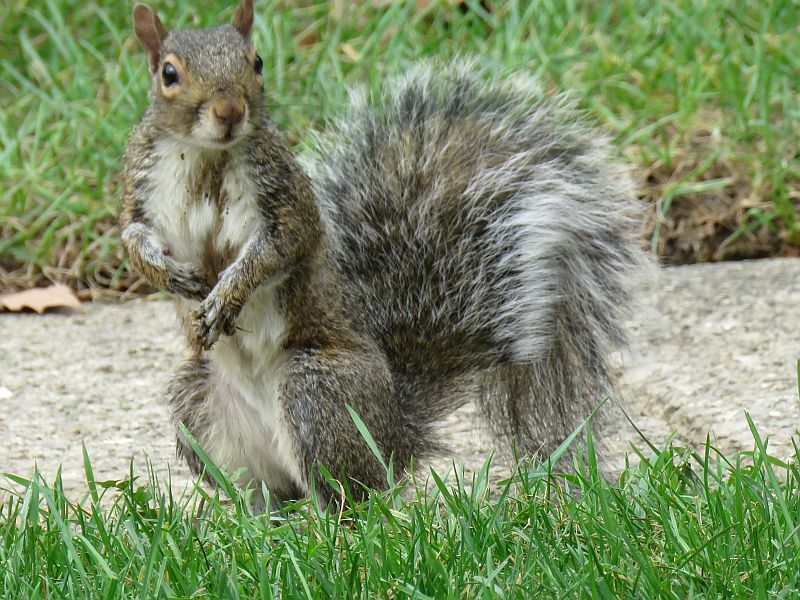 One was gray (pictured), two others where whitish (one bigger than the other). One stayed in the shed occasionally. People often are scared of them, but they are slow and gentle, part of nature’s cleanup crew scavenging anything they can eat. This is actually a marsupial, not a mammal, with a pouch for gestating its young (just like a Kangaroo). Now, to the true mammals. 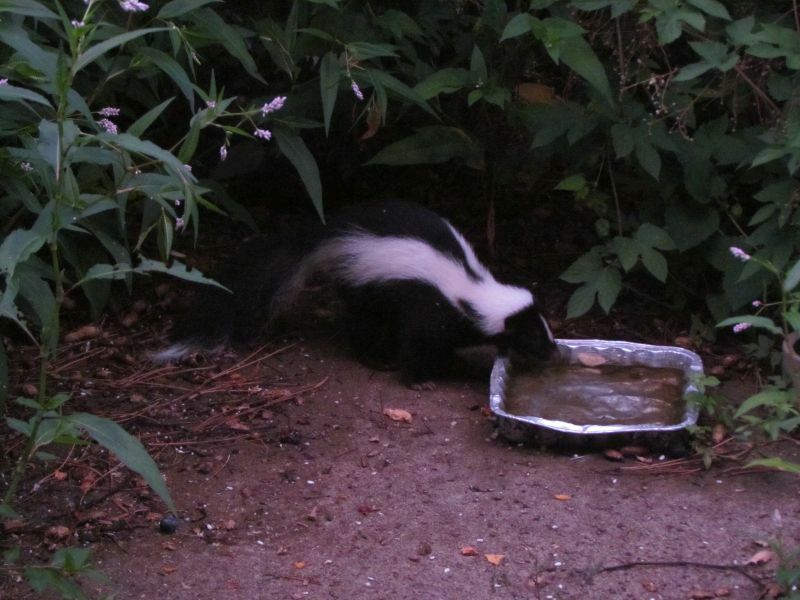 I had five- yes, five- Skunks visit last summer (usually one at a time, but not always). These were nocturnal visitors too. 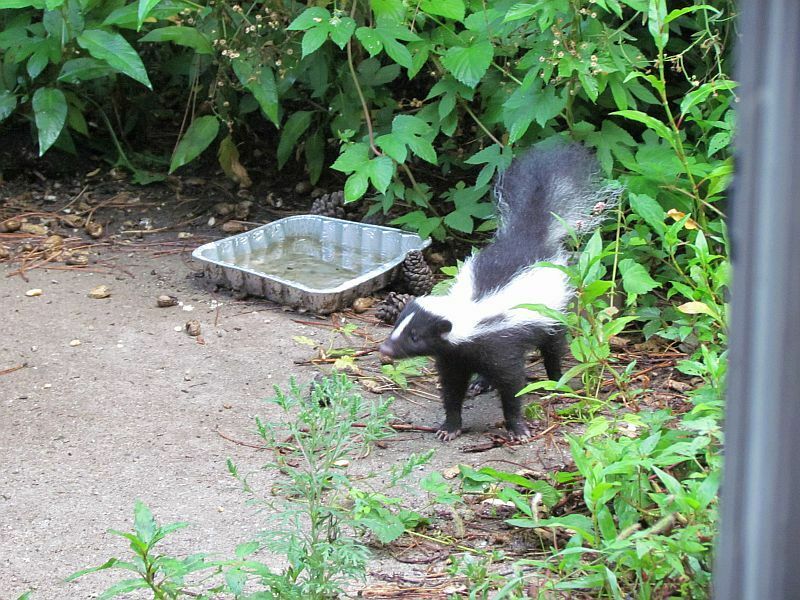 Skunks have a reputation for spraying foul-smelling liquid at things they don’t like, and I have smelled their spray around the neighborhood. But they are reluctant to take this step and often scare off threats by puffing up their tails and raising them high. 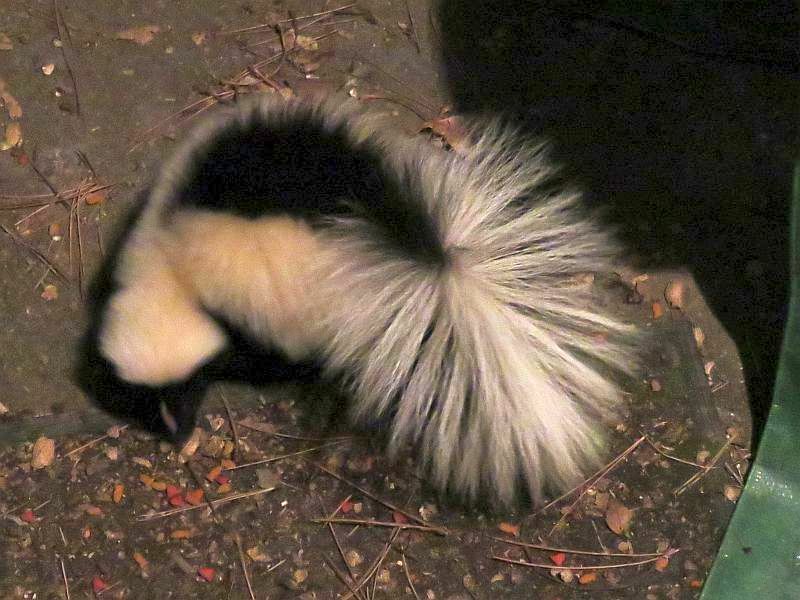 Here’s a good look at a Skunk tail. They are beautiful creatures. How do I know there were five different Skunks? They all have different patterns of white and black fur. Sometimes there are distinctive black patches in their white areas. You can see the differences in the photos. 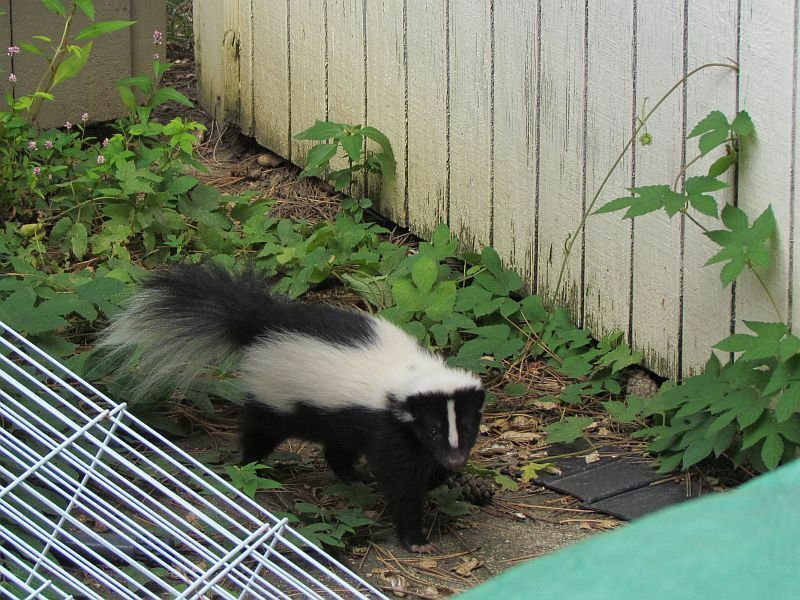 I accidentally startled a Skunk once next to my patio, and it ran off. They will only spray if you get very close to them and they can’t get away. 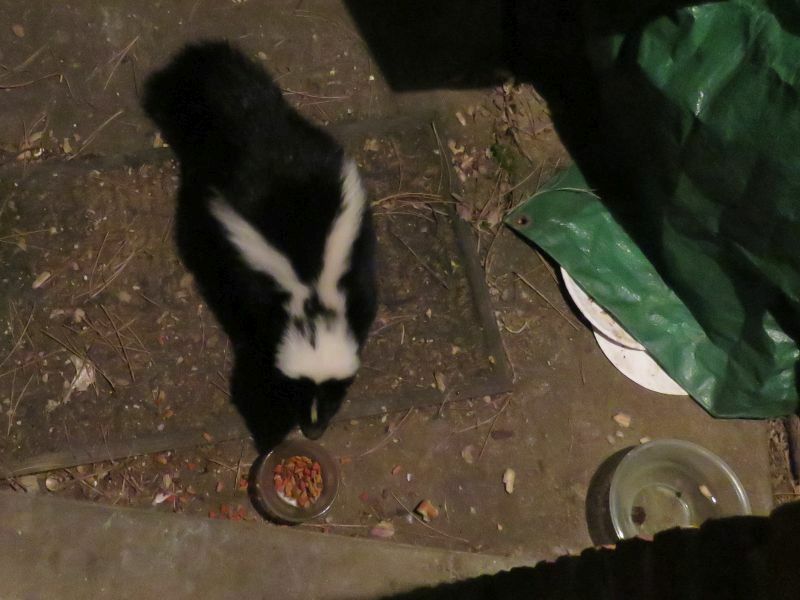 I see less Skunks and Opossums in the cold weather now, but there is one Skunk I still see regularly (before the bitter cold snap recently anyways). 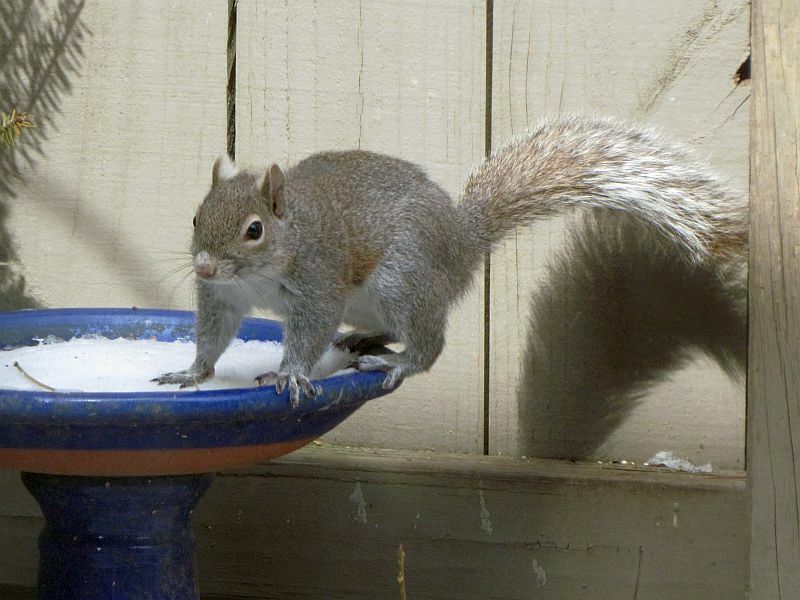 And finally, it’s Gray Squirrel time! 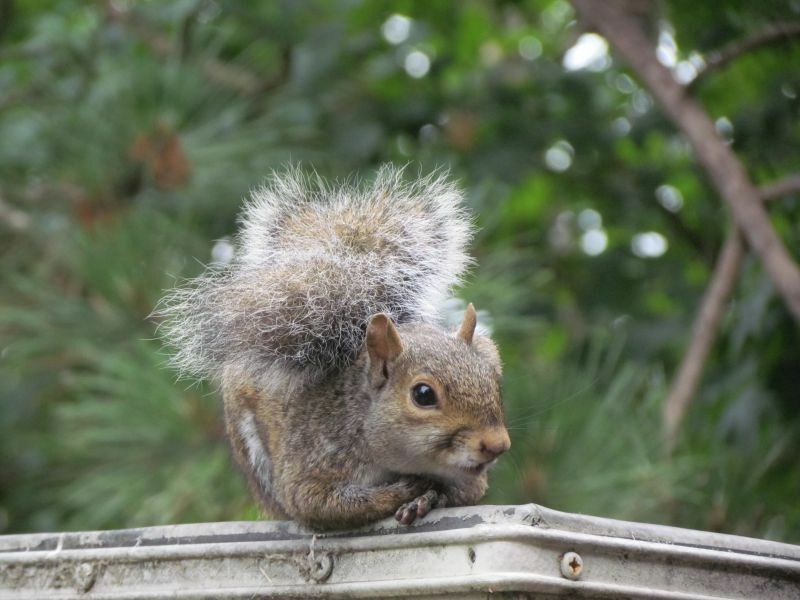 You either love them or hate them, and if you feed the birds, you typically end up feeding Squirrels. I enjoy their antics myself! These guys and gals have their own personalities if you study them closely. Some of them come up to me when I walk to my car in the parking lot, knowing I’m good for a peanut handout. 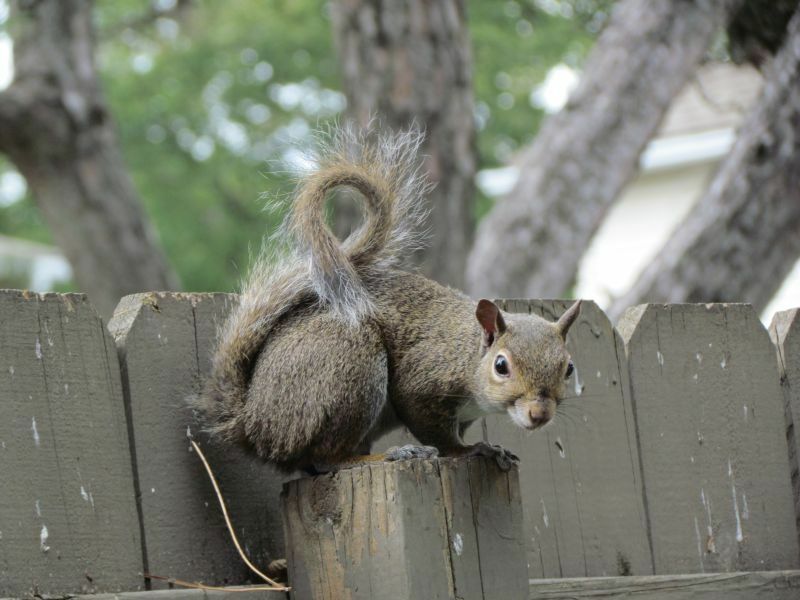 I call this one Guard Squirrel. 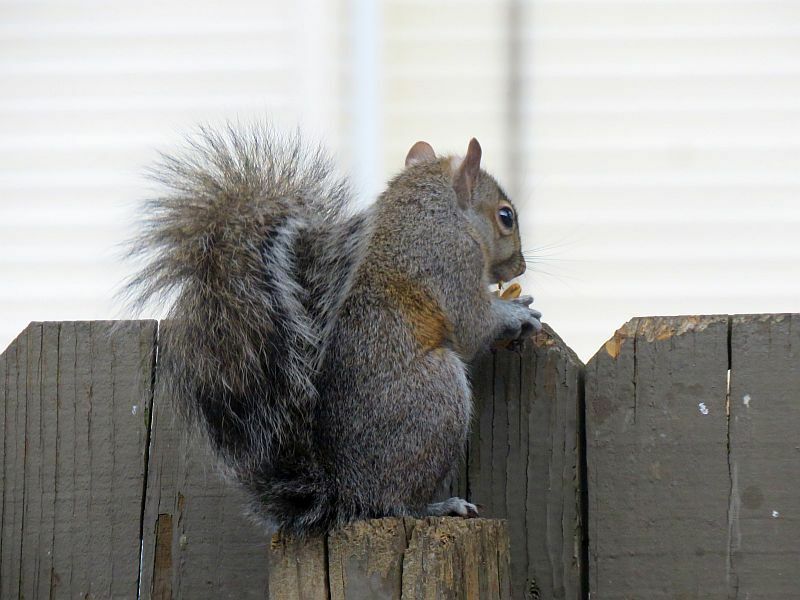 It’ll take a peanut up to the top of the fence and seemingly keep an eye out for trouble while eating. This is Shavetail. I’m guessing somebody grabbed that tail and got a double-clawful of hair. This is Gimpy. 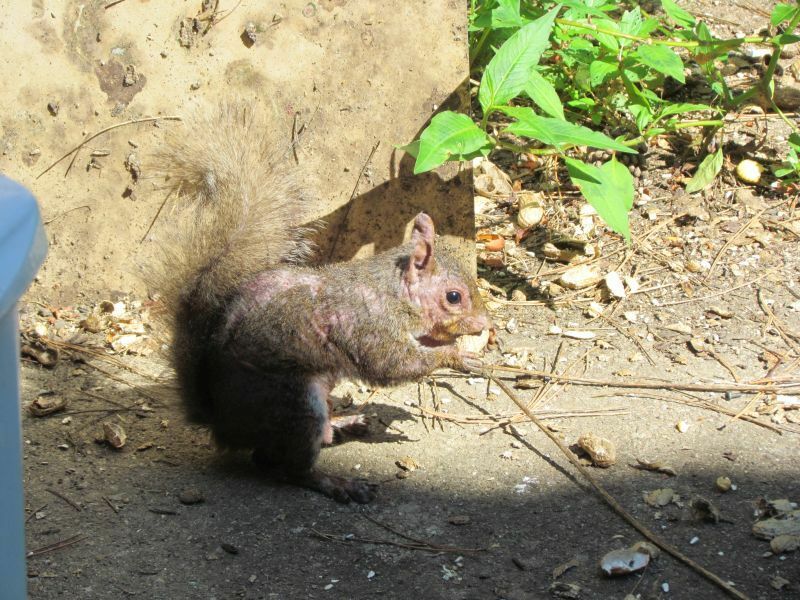 Gimpy got in a fight one day with another Squirrel and was injured. He or she sort of hobbled on the left rear leg for a while, almost dragging it. Luckily, it healed up and now, months later, you can barely detect a limp. 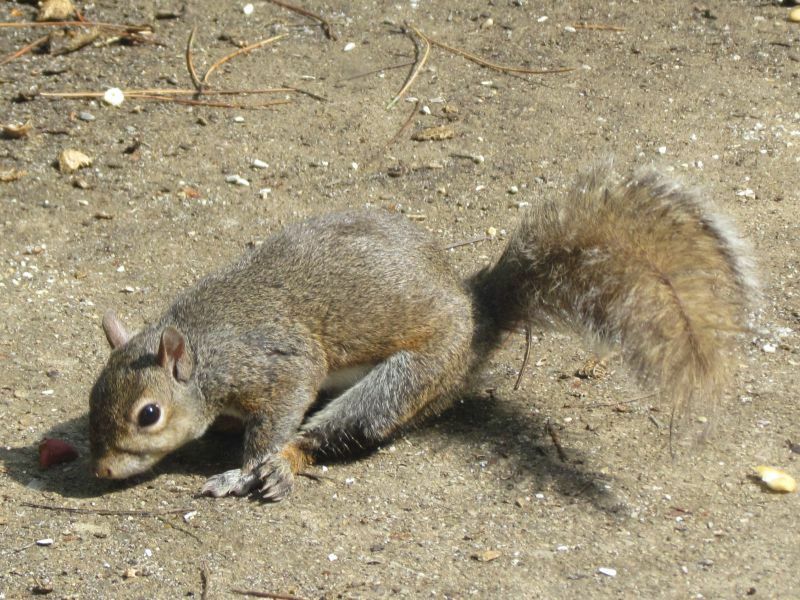 This poor Squirrel probably has mange. It either got better or I stopped seeing it after spotting it a few times. Here’s Notch (check out its right ear for why I came up with that name). This cute face is why the peanuts keep coming. They can turn on the charm. 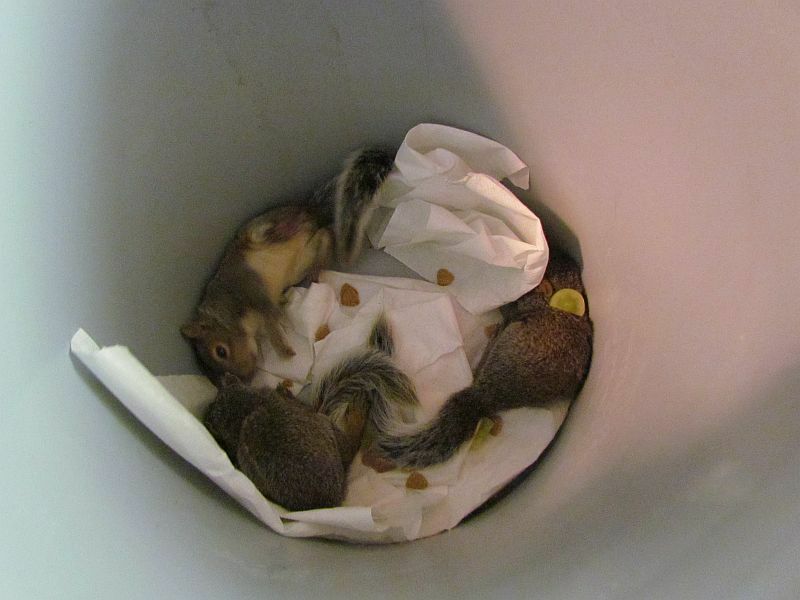 Here’s a bucketful of young Squirrels who lost their mom and had to go to the Ohio Wildlife Center to be raised and then released. Don’t take them away from their area unless you are sure their mom is nowhere around- it’s possible that mom was hit by a car and killed and they were wandering around before they were old enough to leave the nest. 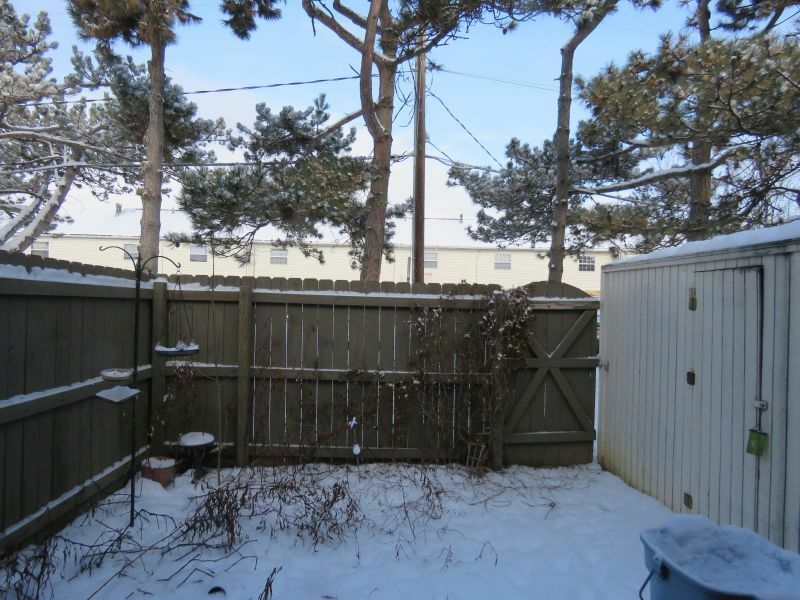 And now it’s time to say goodbye from frozen central Ohio! I hope you enjoyed this look back to last year on the patio! 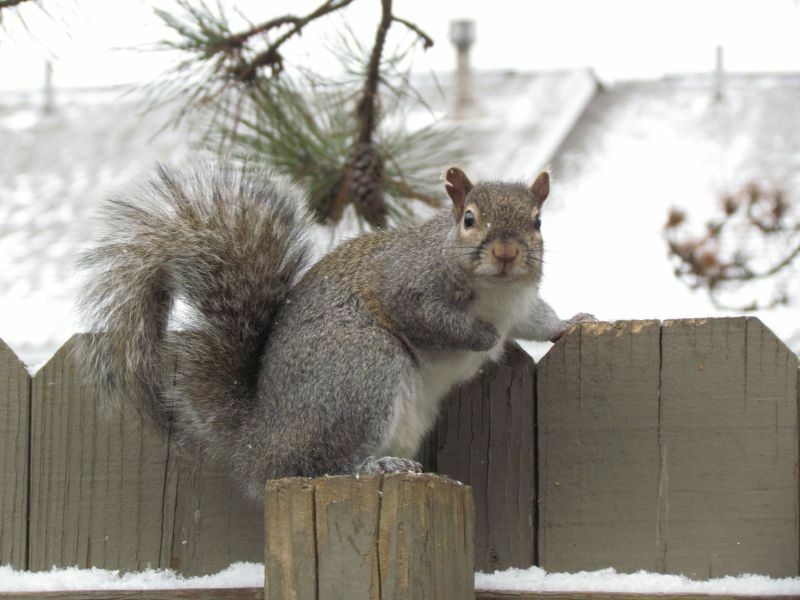 Thank you for sharing,I feed my feathered friends but must be too cold today only the squirrels came. Nature literally at your doorstep! That’s a heck of a peanut gallery, Tracy! Wonderful shots, I love seeing all of the critters. Happy New Year! Many thanks and Happy New Year to you, Composer! 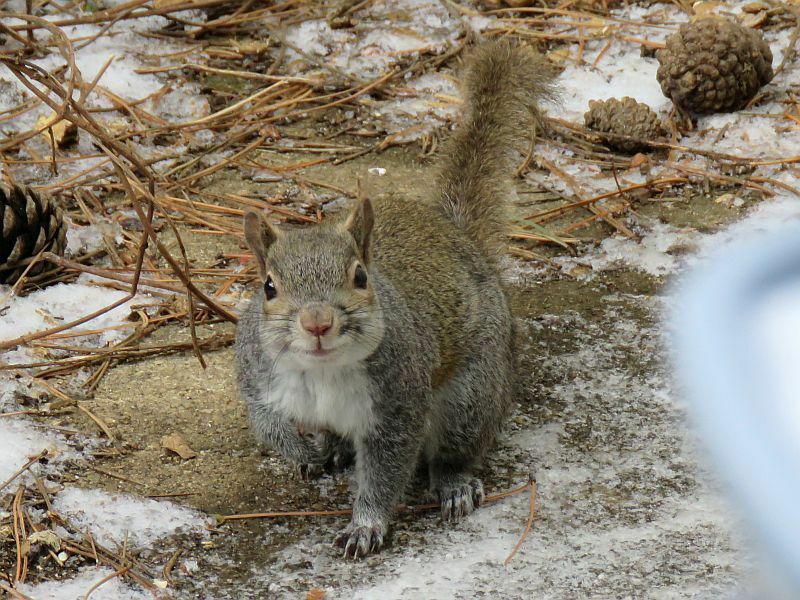 That is one adorable squirrel pic. I’d keep the peanuts coming, too. I have a bunny and an opossum (or two) who take turns on the platform feeder when the birds go home for the night. It’s very difficult to simply attract birds, isn’t it Patti? As far as I’m concerned, the critters are welcome too.